I thought that this would be very appropriate for my final blog post – a “To Do” Clock! I’m retiring and I hope “to do” more of what time hasn’t allowed for before. I hope I have time to do more creating – it’s at the top of my list. You will need 2 Modern Plaques for this project. Both of them are Savannah Plaques – one is larger and one is smaller and thinner. They work well together because they have the same shape. 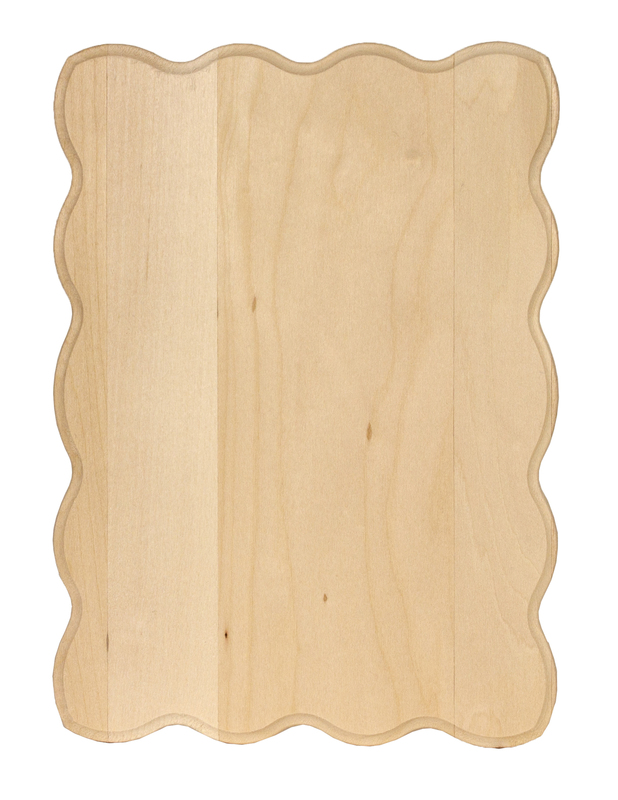 Decide where you will place the clock movement on the large Savannah Plaque. Mark the hole location with a pencil. Use a drill with a 3/8” drill bit to make the hole. 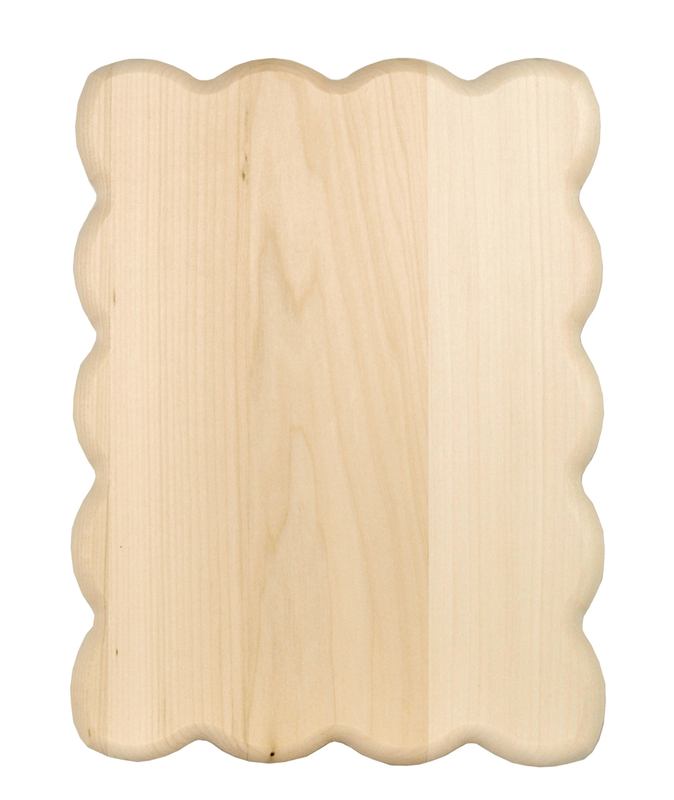 Using a large flat brush, apply DecoArt® Americana® Chalkboard Paint in Black to the large Savannah Plaque. 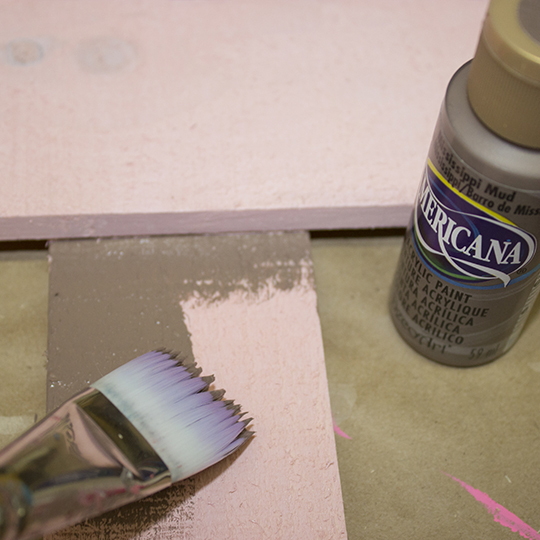 Use a large flat brush to apply DecoArt® Americana® Indian Turquoise to the smaller Savannah Thin Plaque. 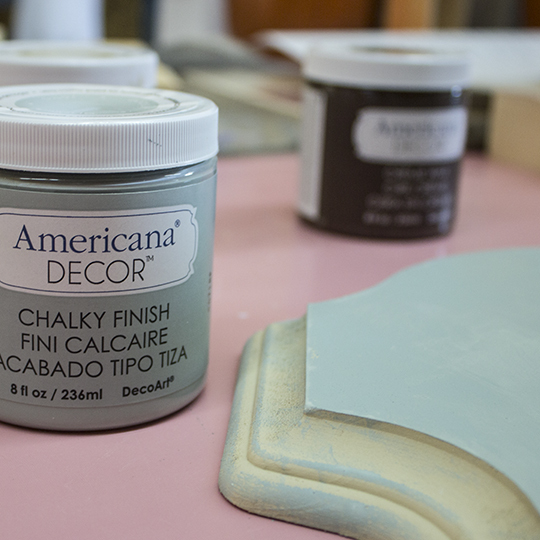 To make the turquoise plaque ready for chalk, apply DecoArt® Americana® Chalkboard Paint in Clear to the top surface. 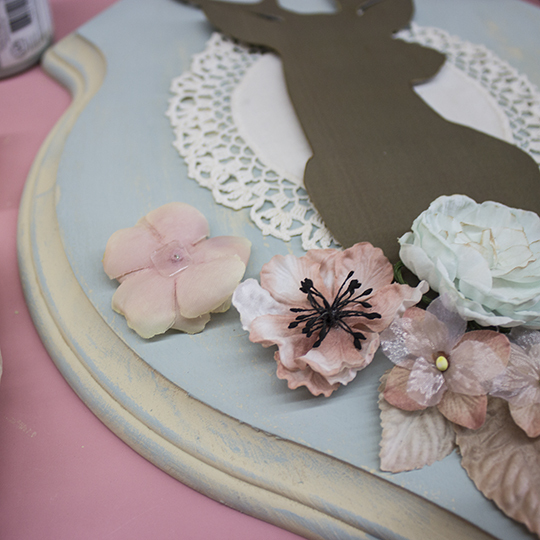 The Clear Chalkboard paint is great because you can turn any color into a chalkboard. 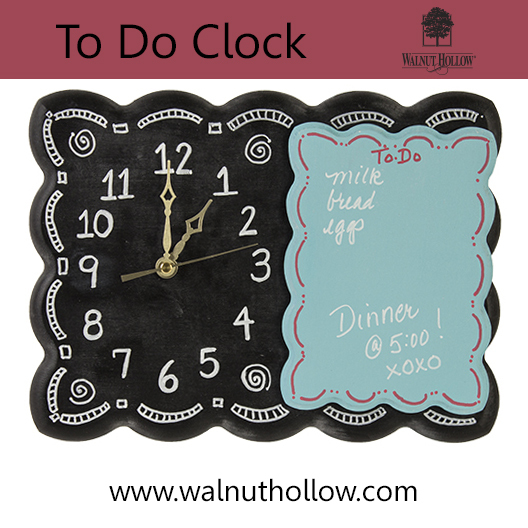 Use Marvy® Chalk Markers to add clock numbers and details to both plaques. I used white on the black chalkboard and red on the “To Do” list. 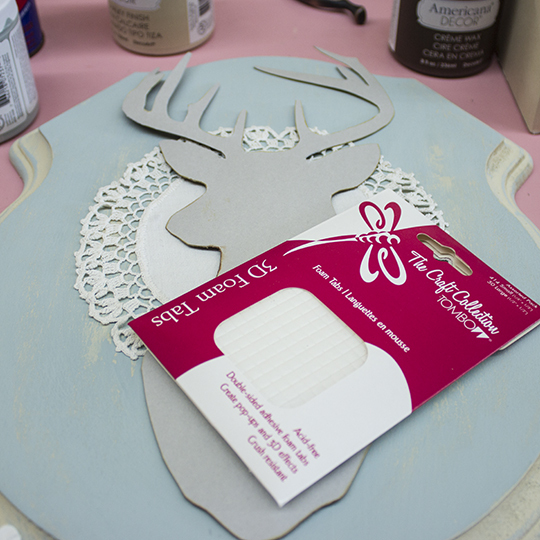 Use Tombow® MONO Multi Liquid Glue to adhere the Savannah Thin Plaque to the large Savannah Plaque. 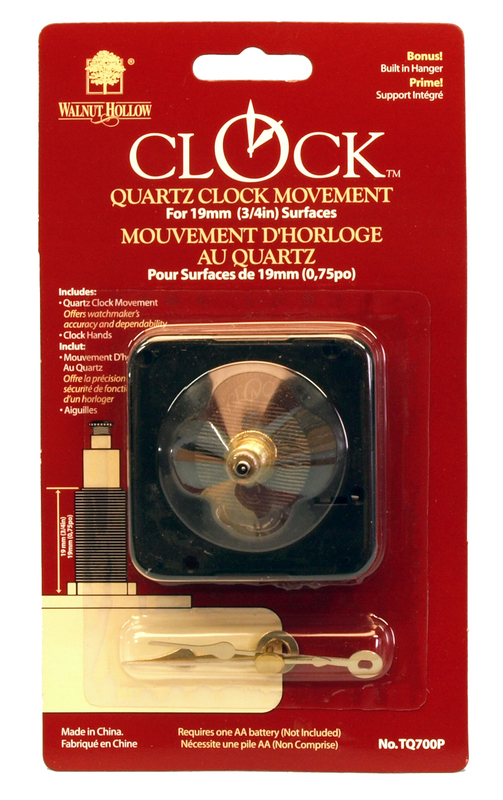 Attach the clock movement (TQ700P – with the 3/4″ shaft) and hands following the manufacturer’s instructions on the back of the packaging. Insert an AA battery and set the time. I hope you have enjoyed creating with me. It has been my pleasure to share with you what I love to do. Now I’m off to retirement and to do more of what makes me happy! When you plan your next Wine Party, keep these in mind! They are really easy to make and will add a special touch to your party décor. 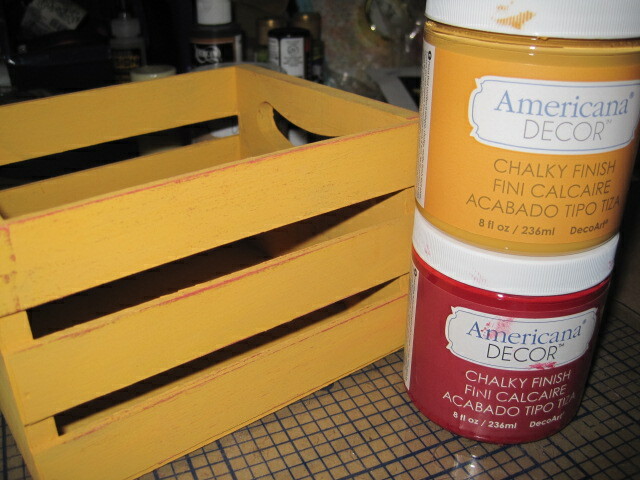 I started with the Rustic Pallet, 7.63” x 7.63” – and flipped them to use the bottom for my project. Using a medium flat brush, I painted the wood with a wash of DecoArt® American® acrylic paints – Burnt Orange and Hauser Medium Green. 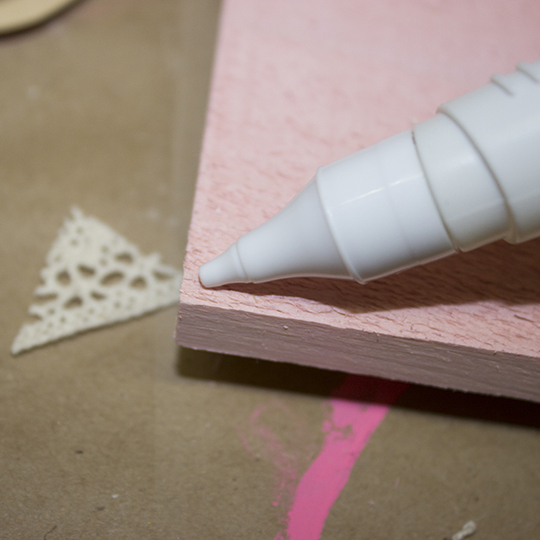 Use Tombow® MONO Multi Liquid Glue to adhere 6” square cork tiles to the center. 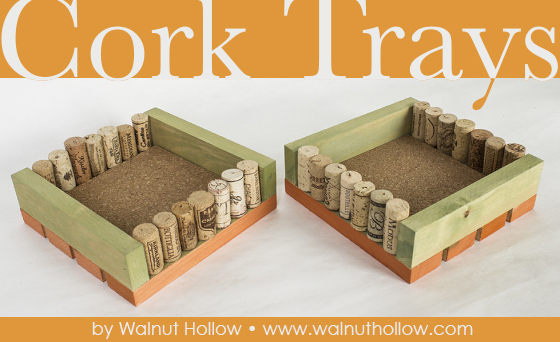 Use the same glue to adhere used corks – you probably have a collection of them somewhere! 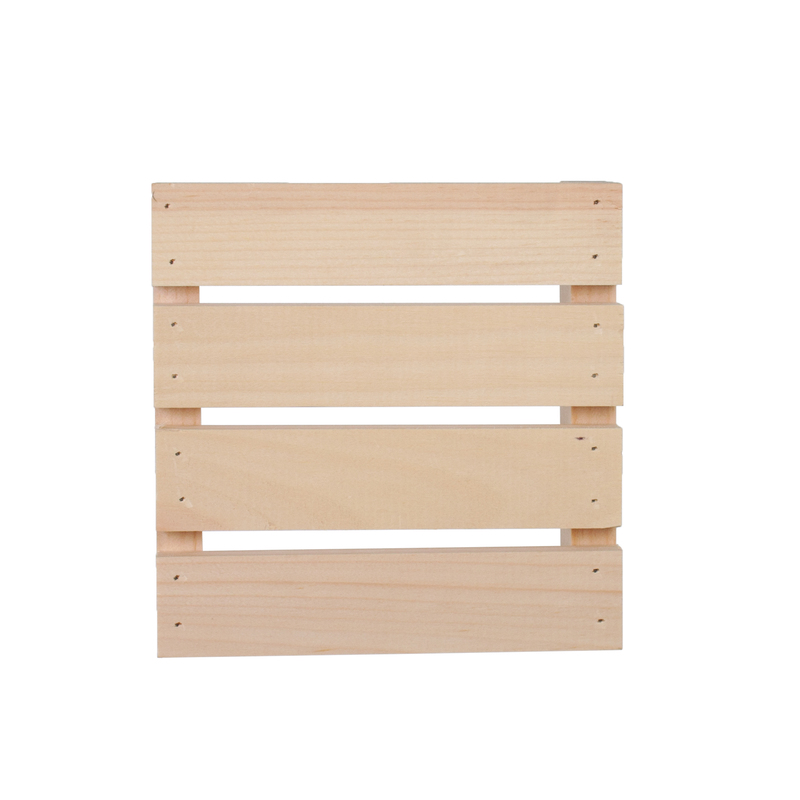 – along 2 edges of the Pallet. You can use these a couple ways – either as serving pieces for your wine and appetizers or make one for each guest to use to hold their wine glass (it won’t slip on the cork!) and food. 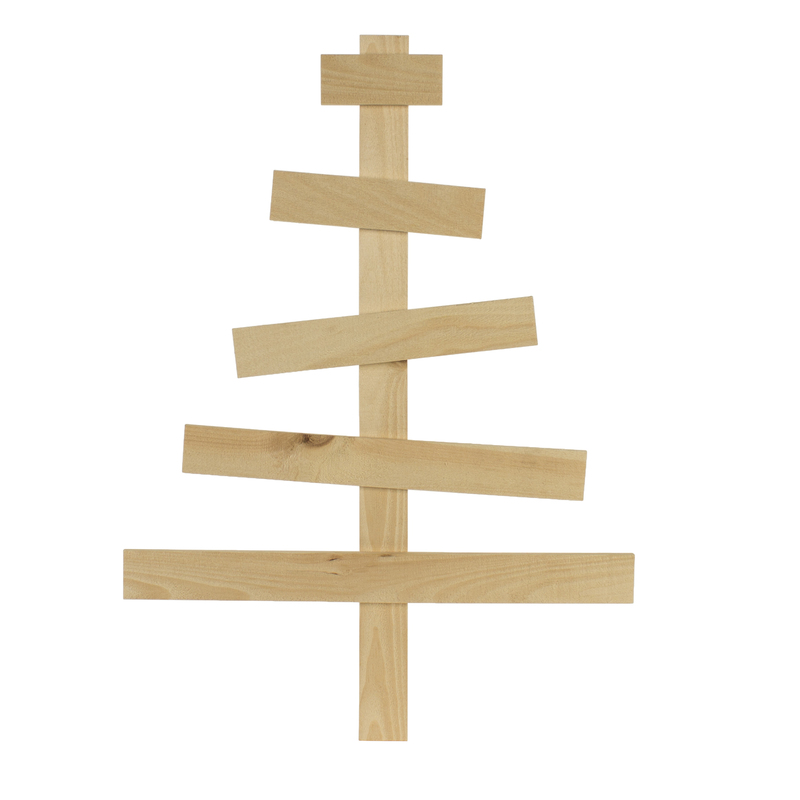 The Rustic Pallet Collection’s Rustic Tree is not just for Christmas! 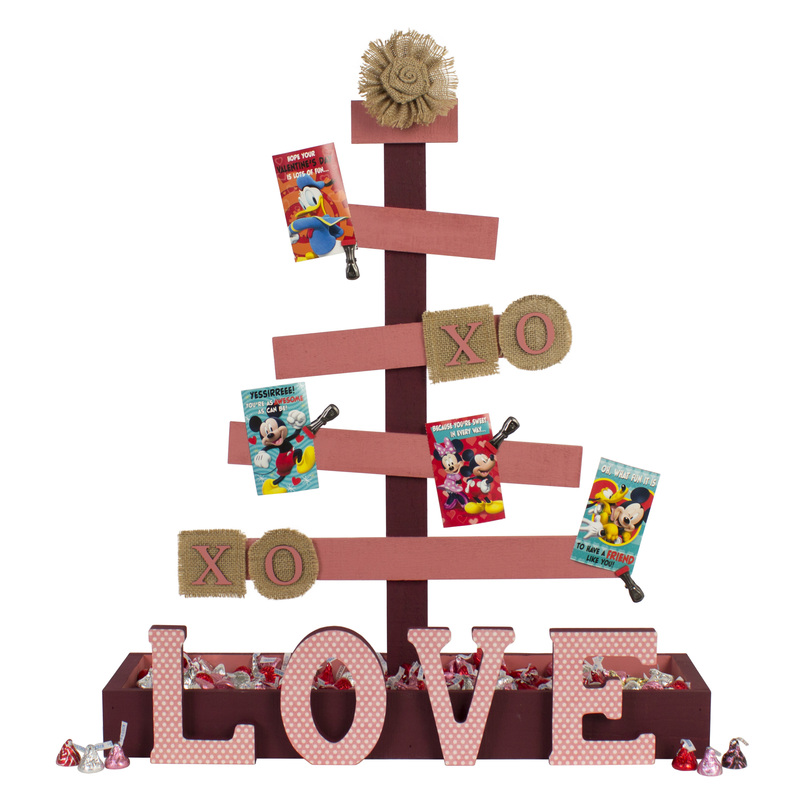 You can create Trees to celebrate many occasions – Christmas, Halloween, Valentine’s Day, Easter, 4th of July, Back to School, Thanksgiving, Birthdays and Special Occasions! I’m sure you can think of a few more. This time I added the Rustic Wood Ledge and 5″ and 1 1/2″ letters to the mix. 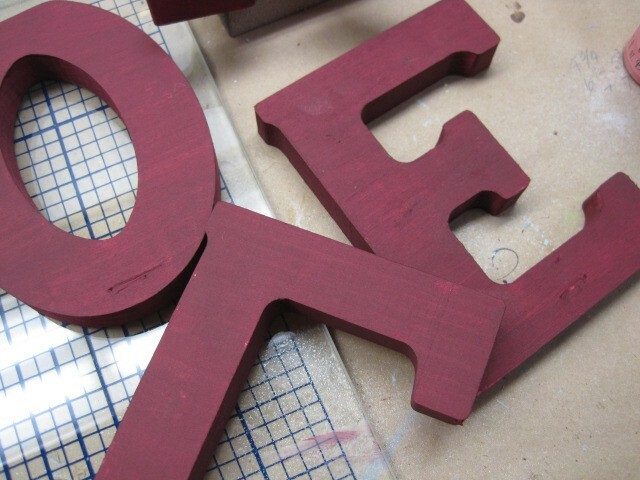 Begin by basecoating the Tree, Ledge and Letters with DecoArt® Americana® Cranberry Wine and Terra Coral. 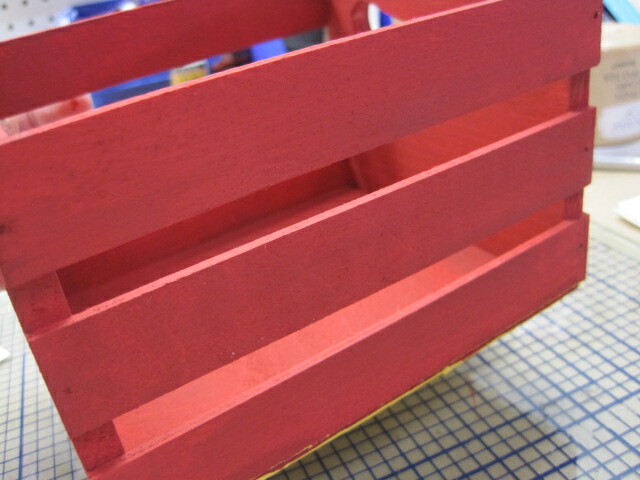 Alternate the colors so you have nice contrast for the wood pieces. I added Graphic 45 paper (Botanical Tea) to the front of the 5” letters – it’s simple, just trace around each letter with a pencil, cut and adhere with Tombow® MONO Multi Liquid Glue. 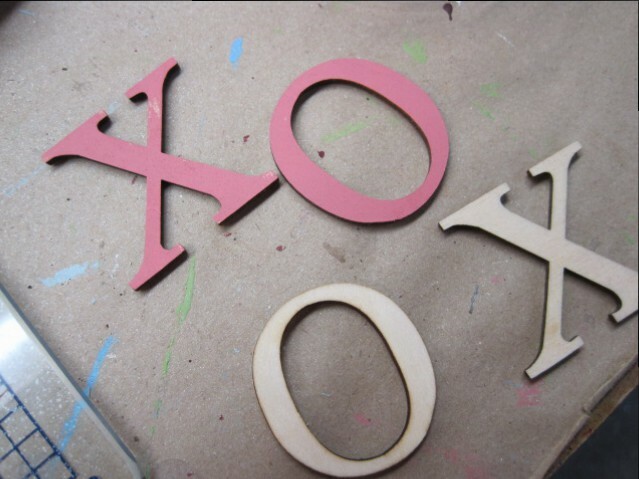 I used the same glue to adhere the 1 ½” letters to the squares and circles of burlap. 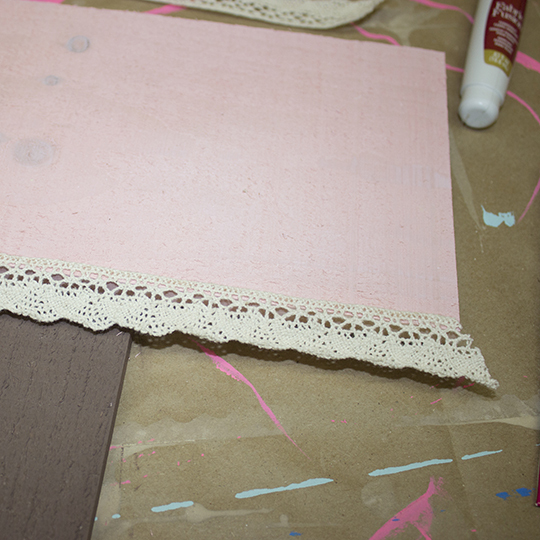 I used Tombow® Power Tabs to adhere the burlap pieces to the Rustic Tree. If you use Power Tabs, you can change the burlap attachments or move them around when you wish. 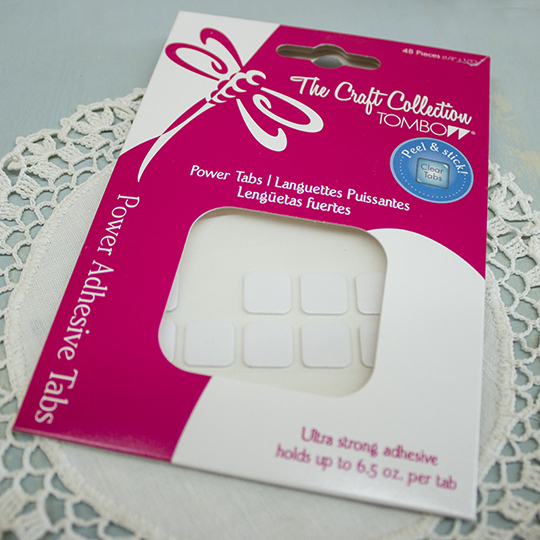 The Power Tabs hold extremely well, but can be removed when needed. The burlap flower at the top of the tree was purchased at Joann Stores – it’s a David Tutera flower that has a stem. I wrapped the stem around the very top of the Rustic Tree. Love the flower! The Rustic Tree was nailed to the inside of the Rustic Ledge. 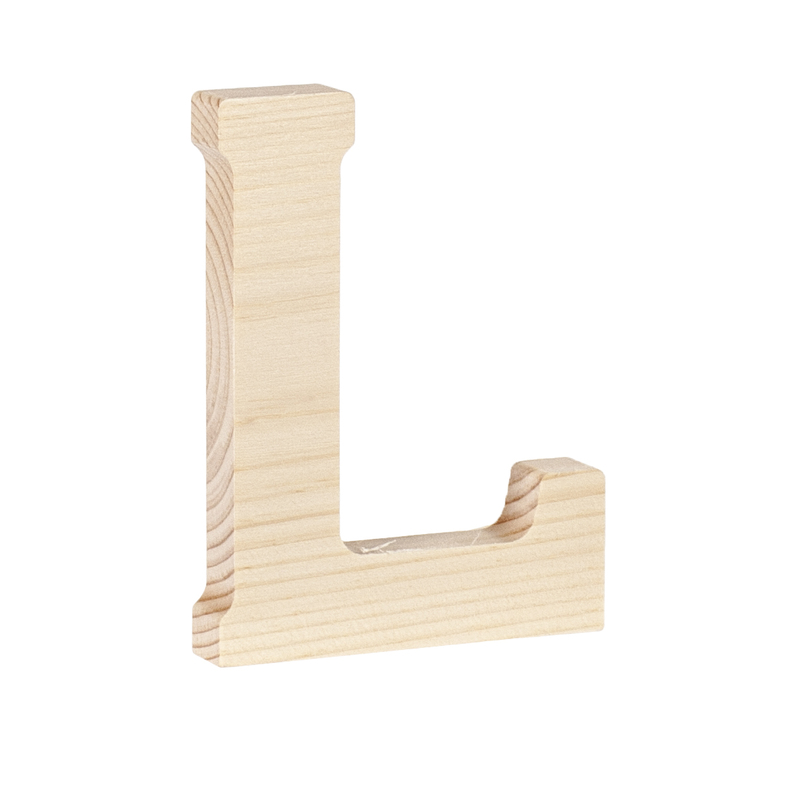 Use Tombow® MONO Multi Liquid Glue to adhere the 5” wood letters to the front of the Ledge. Fill the Ledge with Valentine Kisses – they are in the stores now so go get some. 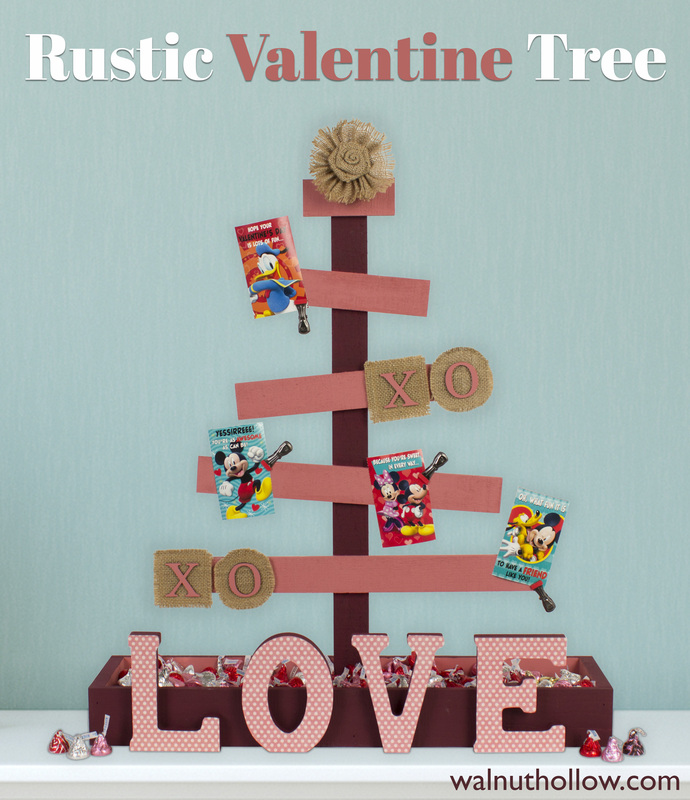 I used small clips to attach the valentines to the Tree. 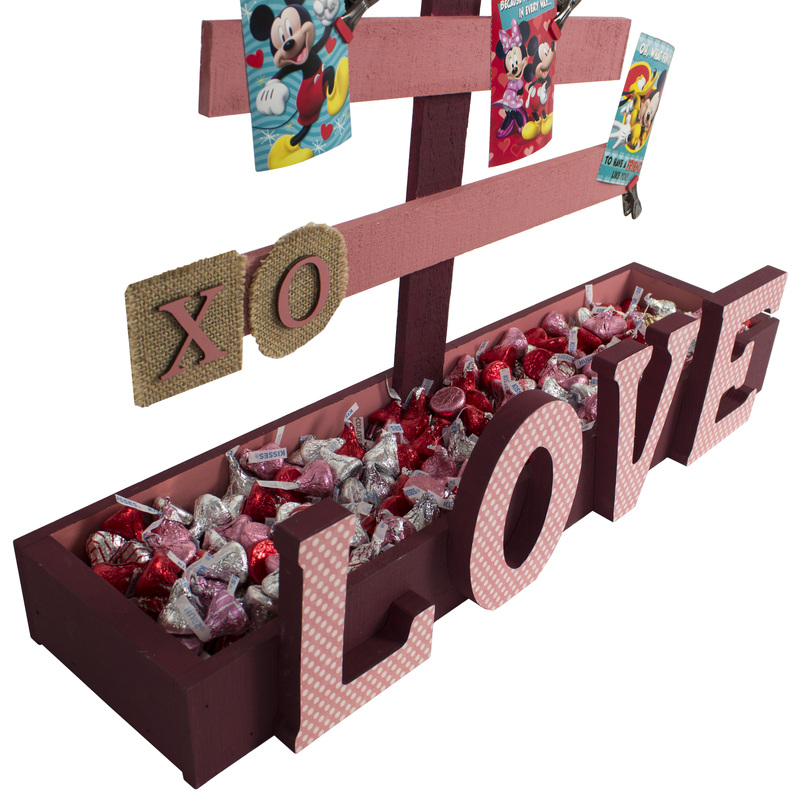 This is a great piece of home décor for Valentine’s Day – save it to use from year to year. Fill with vases and flowers, candy, cards or whatever else you might like! Time for some Throwback Thursday Blogs! Hope you enjoy appropriate Blogs that we will repeat and hope you enjoy one more time………pun intended! I started by misting a small wood clock with Tattered Angels Glimmer Mist – Black Magic. Great name for the color. Look closely at the finished clock and you can see the gold glimmer. 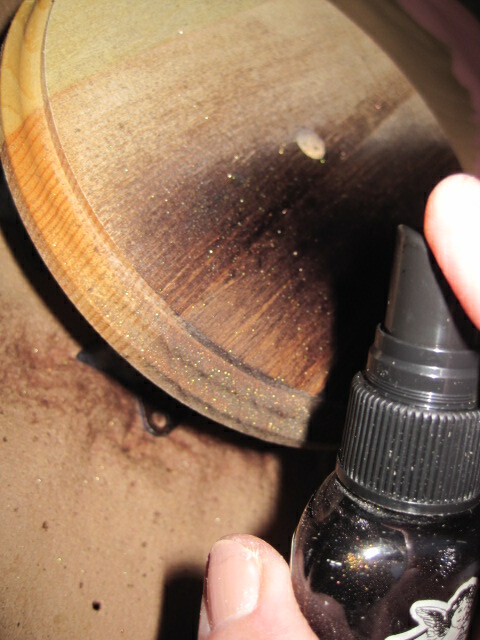 Love using this mist – so easy and there is never a need to seal the wood first. In fact, you shouldn’t seal the wood before using Glimmer Mist. 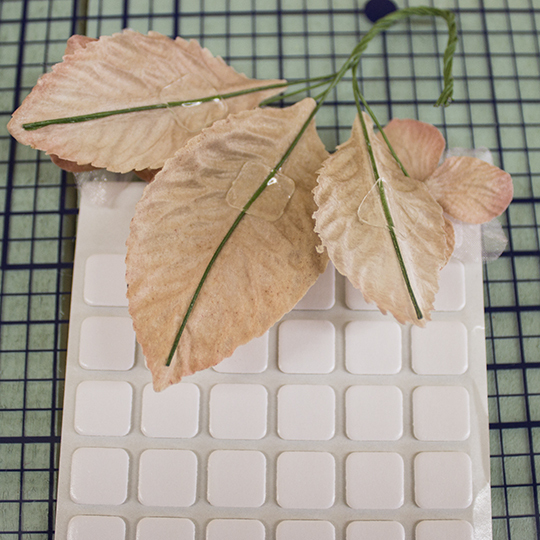 While the mist is drying, choose the button pieces out of the package that you want to represent the numbers. 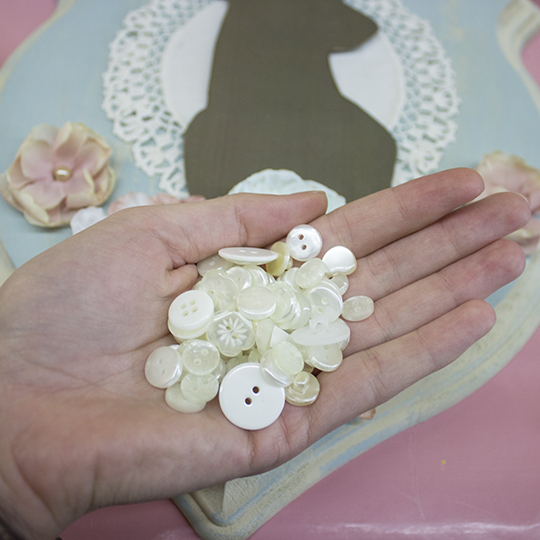 Once you have them picked out, you’ll need to cut the shank off the back of the buttons. I used a heavy duty pair of scissors or use a wire cutter tool. It is a good idea to also use a sanding stick to sand down more of the shank to get the back of the button as flat as possible. 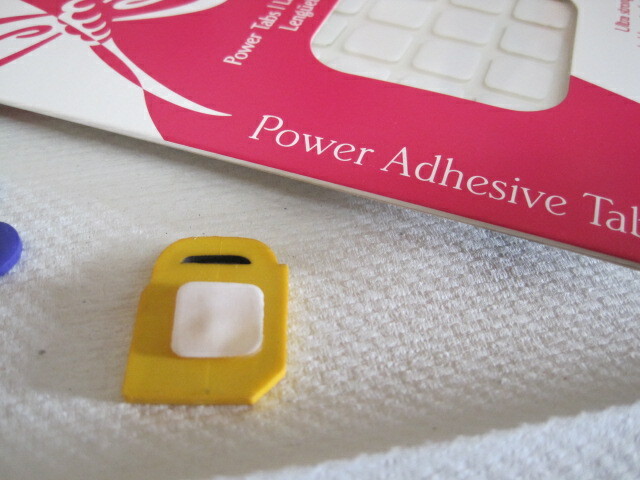 Once the buttons are prepared, place a Power Tab from Tombow® over the cut shank. 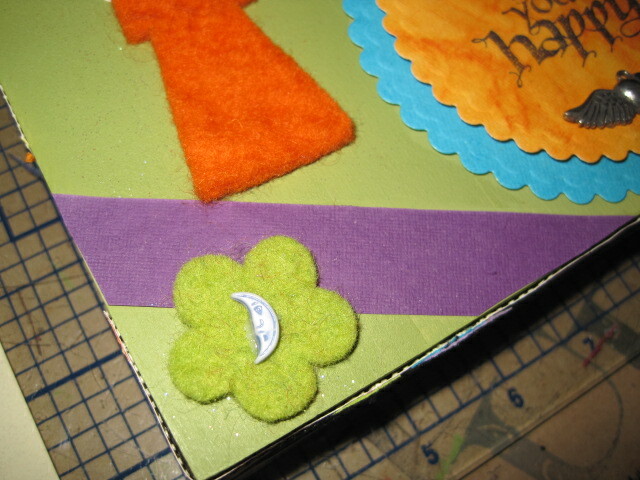 Power Tabs really work the best for embellishments and things like this. Remove the backing from the Tab and press the button in place. I used this clock movement since I already had my “numbers” on the clock. Follow the manufactures directions on the back of the package to attach the movement and hands on the clock surface. 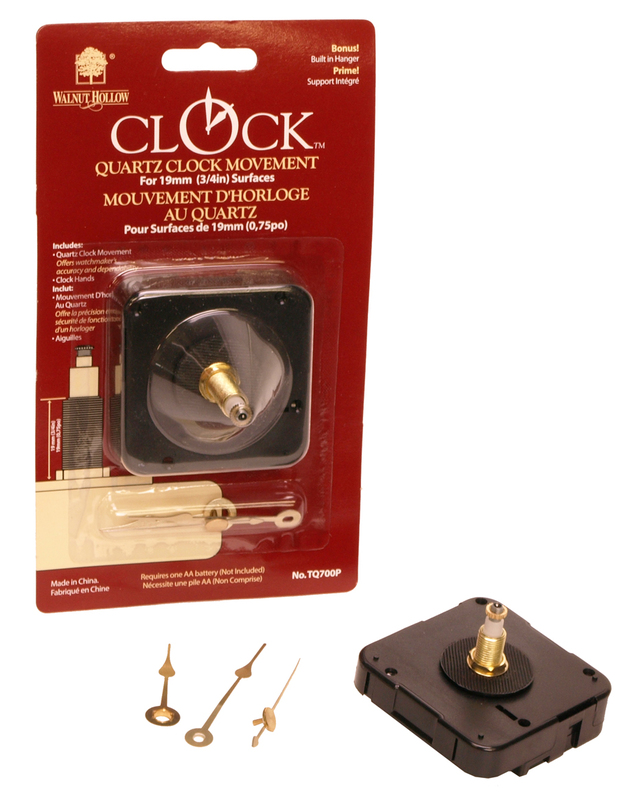 Add an AA battery, set the time and you’re ready to hang your clock. 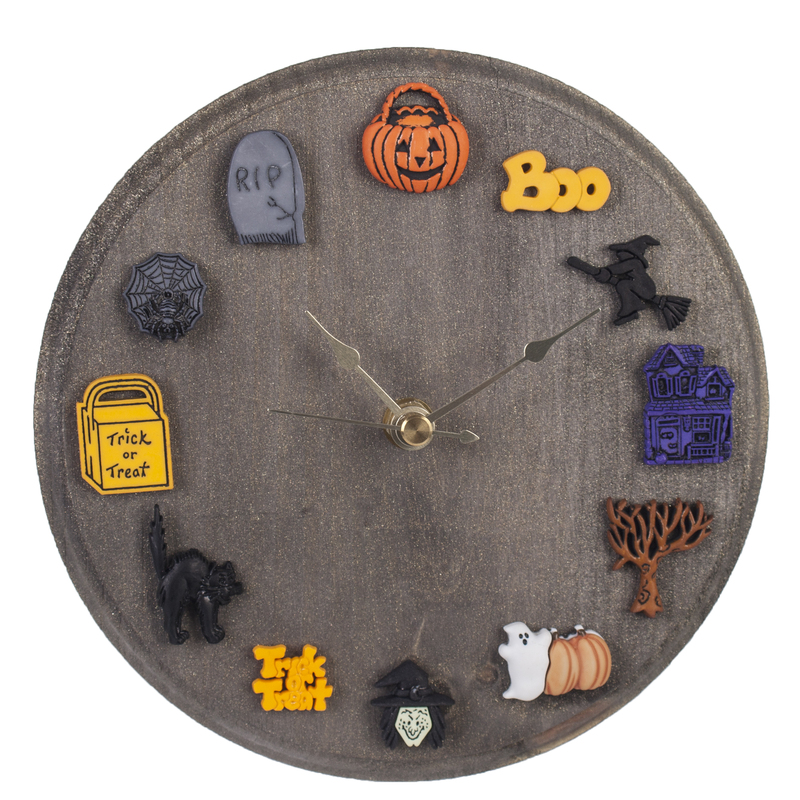 Hope you enjoyed our Halloween Clock again………..check back tomorrow for a great new, and EASY, Halloween project – I think you’ll like it! We are excited to be blog hopping with Quietfire Design all this week. We have so many creative projects to share with you using Quietfire Design high quality rubber stamps with Walnut Hollow Wood Surfaces and Tools. We have a great prize to give away. Let us know what you think about our projects by leaving comments. We will choose a prize winner Monday, October 6. Leaving comments on all of the projects will increase your chance of winning! See where to go next at the end of my post! 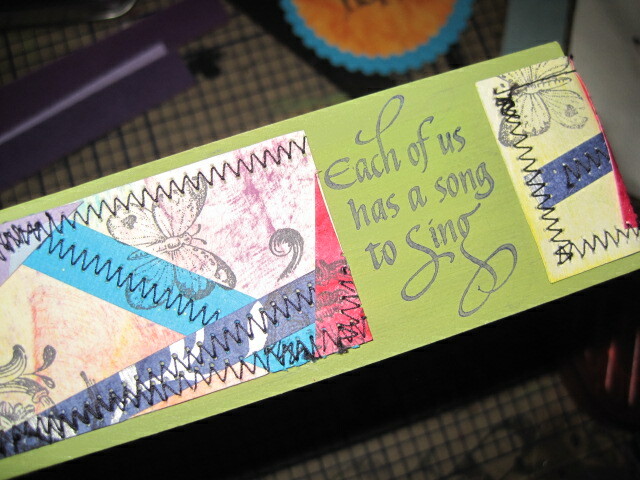 This mixed media project was perfect for Suzanne Cannon’s wonderful calligraphy sentiment stamp set, Twirl & Enjoy. I’m so delighted that she makes them for us to use so we can share these words over and over again! 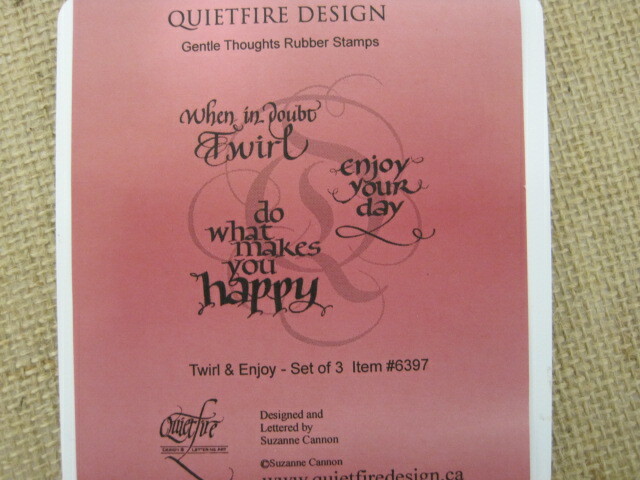 And for many of us, we get to “do what makes us happy” while we are using the stamps. Doesn’t get much better than that. I began this project by using a large flat brush to basecoat the Walnut Hollow Basswood Canvas with DecoArt® Americana® Hauser Light Green. I wanted a little sparkle on the surface, so I added DecoArt® StarLite Varnish, just to the top of the Canvas. The varnish is great because it adds just a touch of glitter. While everything was drying, I cut (3) 1 ½” strips of ivory cardstock and inked, stamped and used my sewing machine to attach several thinner strips of colored cardstock to the ivory paper. 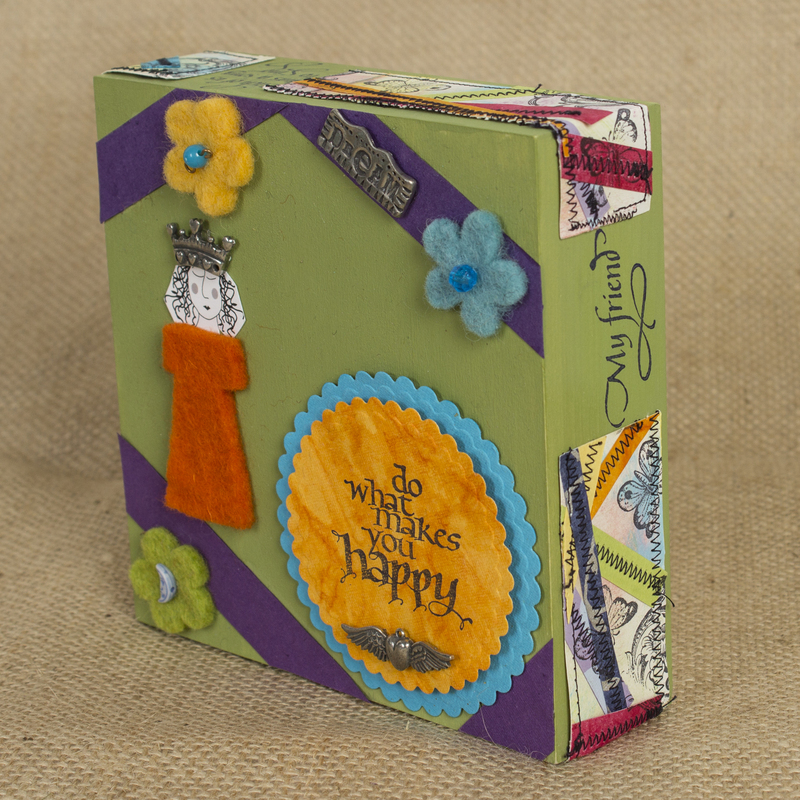 For the ink pads, I used Clearsnap® Tutti-Frutti Queue which includes 6 colors – perfect for this project. 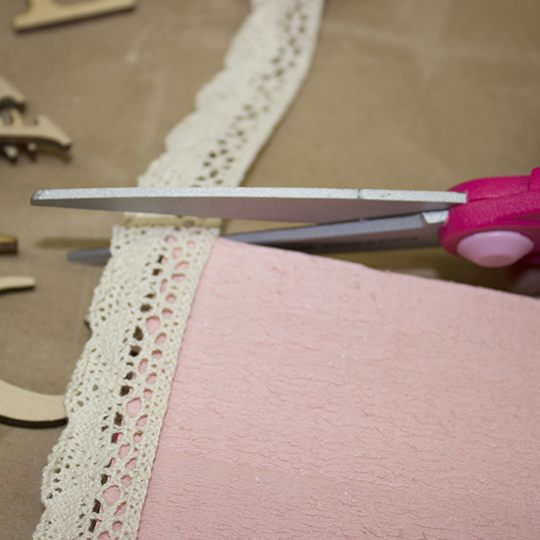 You’ll need to use scissors to cut scrap pieces of felt. Cut a dress and 3 small flowers. Now it’s time to assemble everything. Using Tombow® adhesives, I adhered the different elements to the Canvas. I used MONO Multi Liquid Glue to glue small beads onto the felt flowers and set them aside to dry. Use Tombow® Xtreme to adhere the sewn papers around the wide edges of the Canvas – leaving openings for the stamped sentiments. Also adhere the purple strips and the turquoise circle with Xtreme. 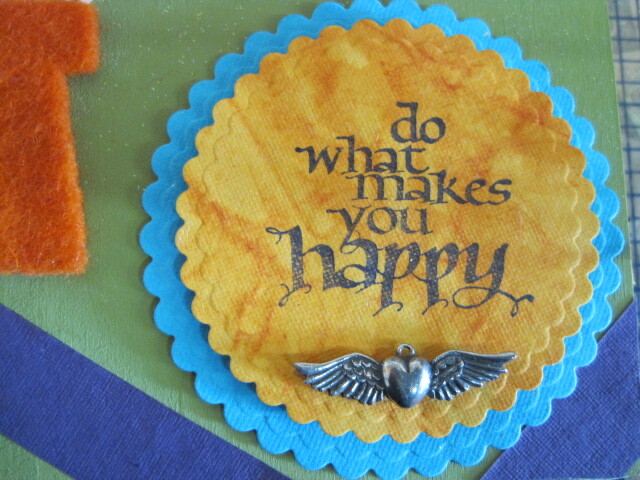 I used Tombow® Foam Tabs to layer the orange circle on the turquoise circle. 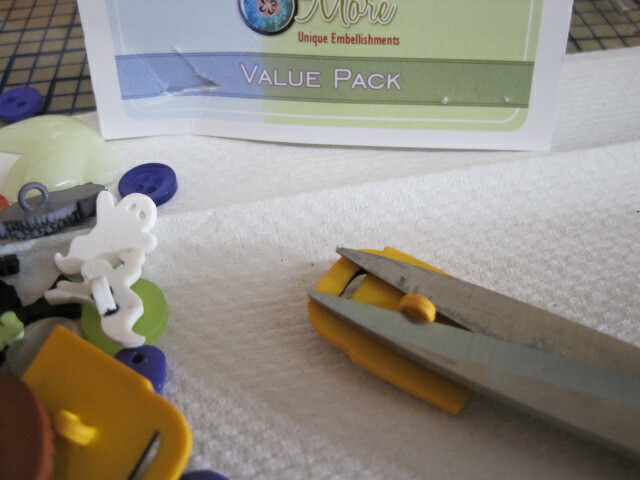 Use MONO Multi Liquid Glue to adhere the felt pieces. Use Power Tabs to adhere the pewter charm embellishments. 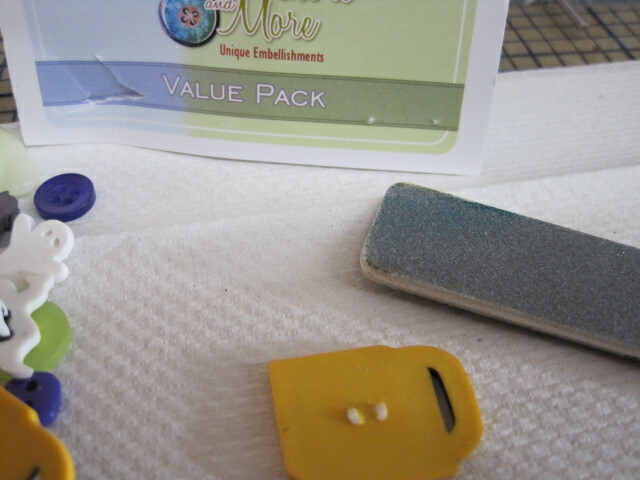 You can cut the Power Tabs into smaller pieces to fit behind each of the charms. 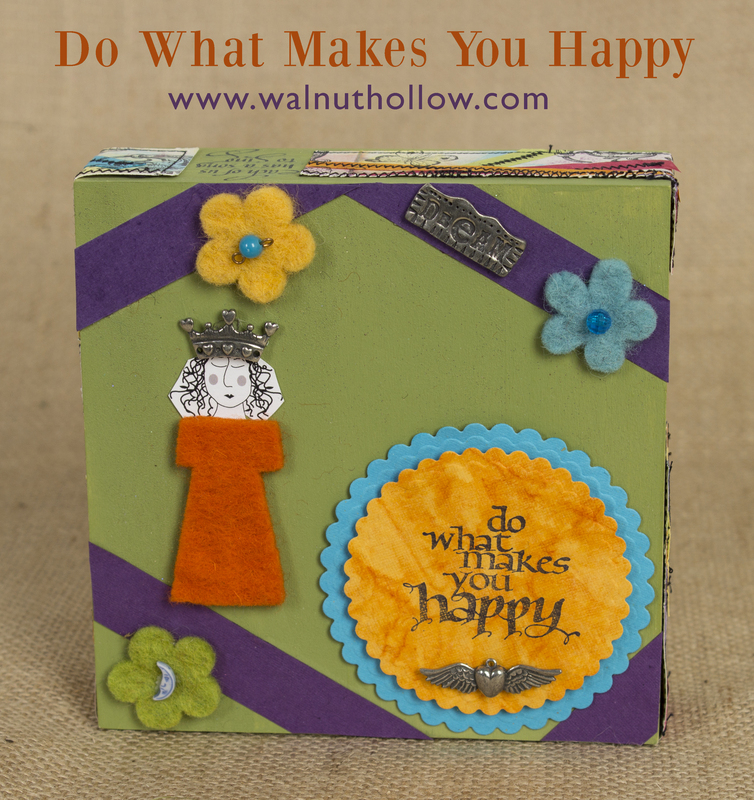 Created by Sara Shirman for Walnut Hollow. We are SO excited to team up with Tombow for another blog hop! 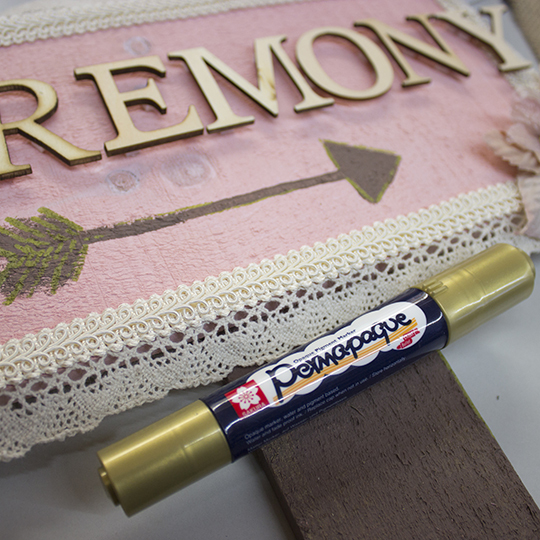 Tombow adhesives are great for all types of projects and they stick especially well to our wood surfaces! Tombow carries a wide variety of products from double sided adhesive tabs/runners and liquid glue to artist pens and pencils. We can’t get enough of their products! Today is the second day of our blog hop- so come back tomorrow for more projects! Be sure to visit all the blogs today and leave comments for your chance to win some great prizes! 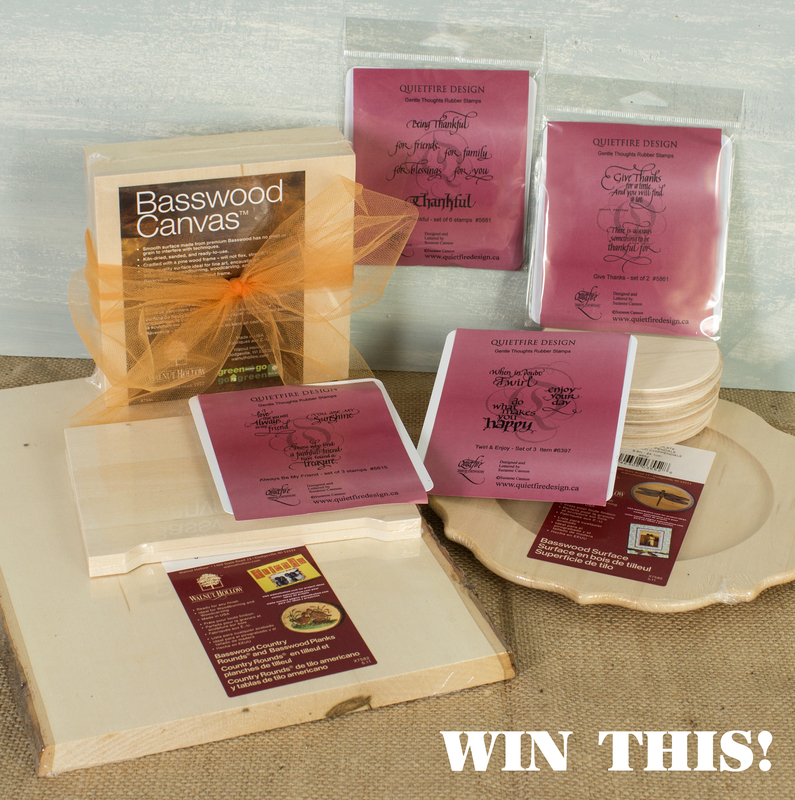 One lucky winner will win this amazing prize package with products from TombowUSA and Walnut Hollow! Winners will be chosen from comments throughout the week, so make sure you check back daily to increase your chances of winning! Also, please make sure you have popped on over to Facebook and “liked” each of the company pages ( Tombow / Walnut Hollow ), because really, what’s not to like?! I LOVE Tombow products so I was really excited to get another opportunity to Blog Hop with them! I decided to create a rustic wall piece using the Walnut Hollow Shield Plaque. I started out by sanding the wood with a hand sander. I base coated the Shield Plaque with Americana Chalky finish paint in “Timeless”- a light cream color. 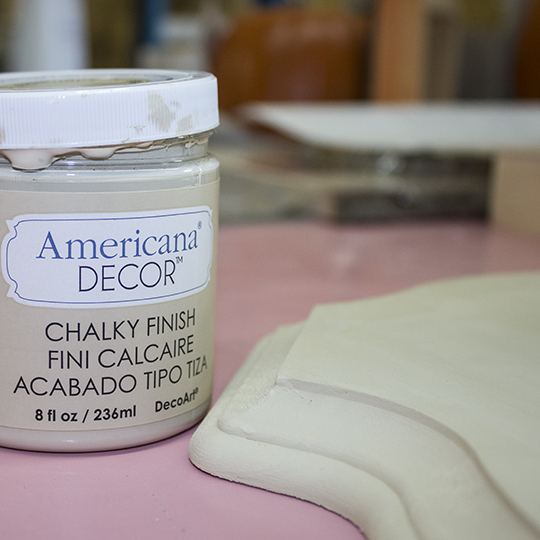 Using a 1″ wide flat paint brush I brushed on the Chalky Finish paint. 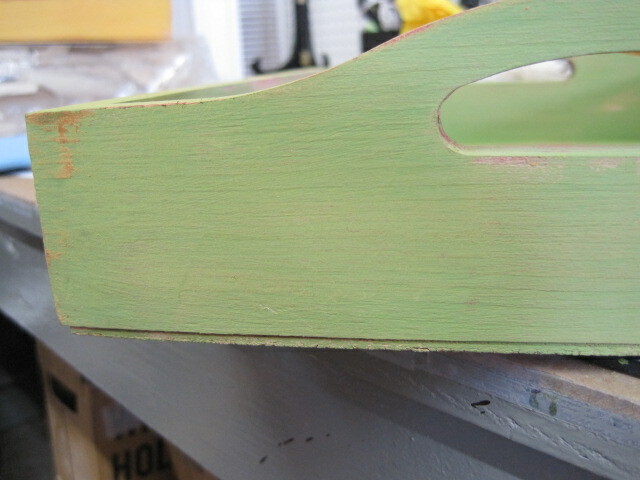 One coat covers the wood nicely and the paint dries with a matte finish. The chalky finish gives a nice shabby chic feel to the project. Once the first layer was dry, I took a bar of clear wax and rubbed it on the plaque. I went over random areas of the surface. I then covered the main flat surface (not the edge) of the plaque with Americana Chalky finish paint in “Vintage”. I used a wide flat brush and pulled the paint towards me, lightly brushing it over the ridges on the side of the plaque. (Not covering the whole edge). This gave it a vintage feel. Once that coat was dry, I sanded back the places that I had rubbed the wax on. The blue paint came off easily revealing the “Timeless” coat underneath. I printed my Deer Silhouette and backed it with card stock. I used scissors to cut out the shape. The edges of my deer silhouette were white because of the thick card stock backing. I rubbed some ink along the side of the deer to darken the edges of the paper. 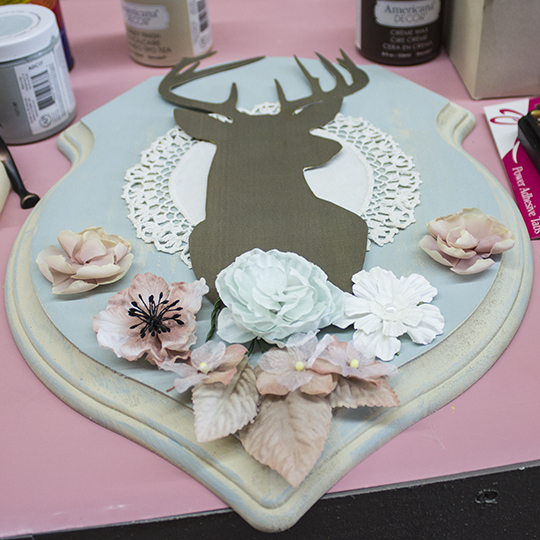 I then planned out where I wanted all of the embellishments on my plaque. I used Tombow Power Tabs to stick my Doily to the center of the plaque. I used Tombow Foam tabs to adhere the Silhouette. 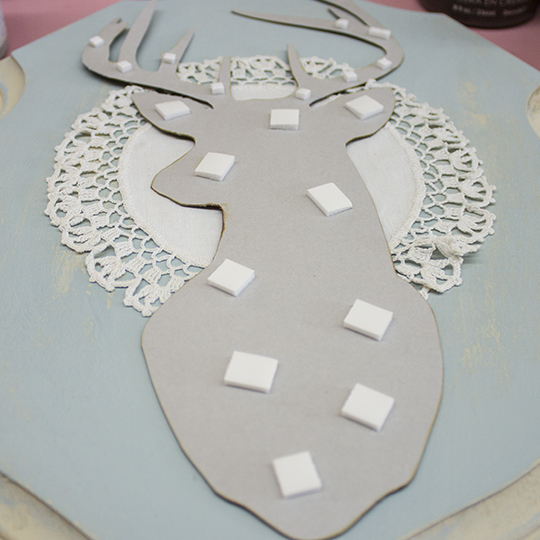 The Foam tabs are VERY sticky and provided some lift and dimension to the Deer Silhouette. They come with 2 sizes. 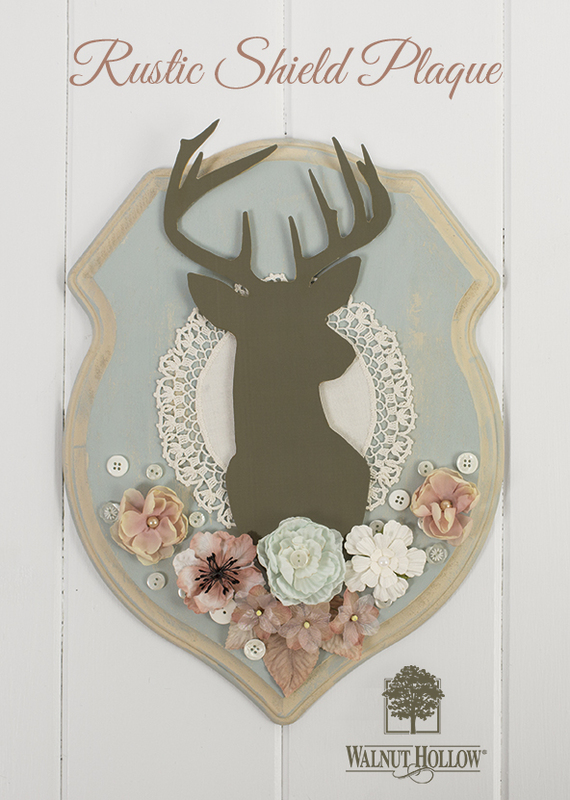 I used the larger ones on the body of the deer and the smaller ones on the antlers. I used more Power Tabs to put the beautiful Prima Flowers on the plaque. I cut the power tabs into quarters and randomly added buttons to the bottom of the shield plaque. This project was really easy to make! 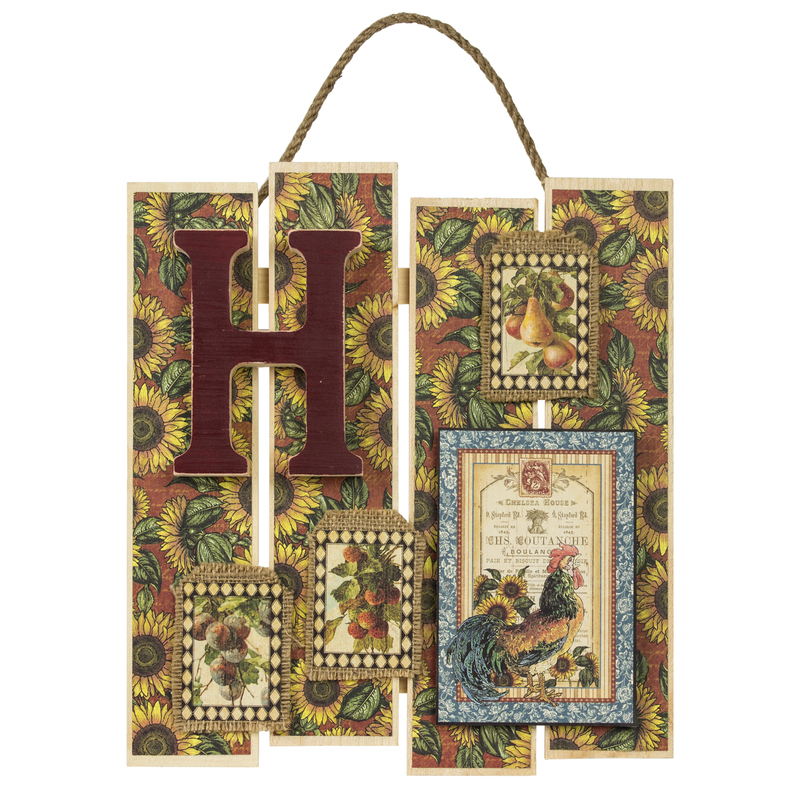 It would make the perfect addition to shabby chic mantel or a vintage floral room. Now that you have seen my Rustic Shield Plaque, be sure to check out of all of today’s posts! 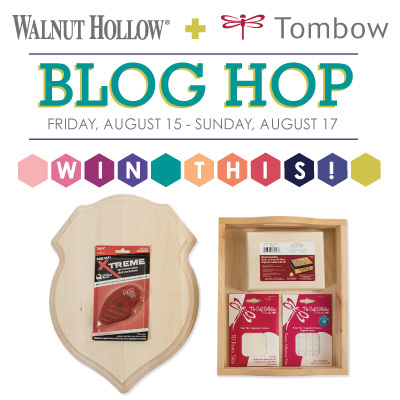 We are SO excited to team up with Tombow for another blog hop! 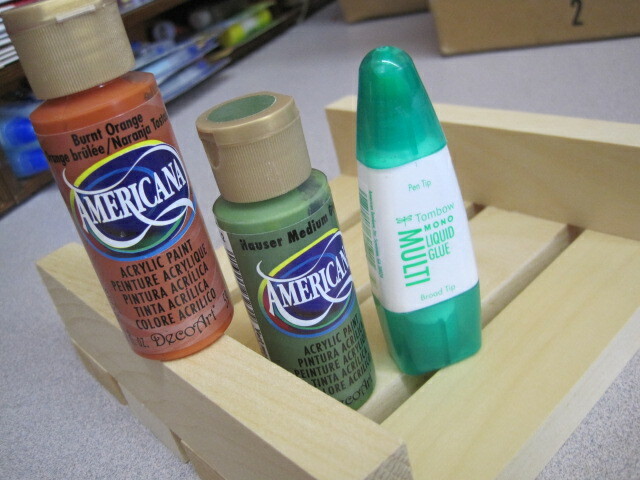 Tombow adhesives are great for all types of projects and they stick especially well to our wood surfaces! Tombow carries a wide variety of products from double sided adhesive tabs/runners and liquid glue to artist pens and pencils. We can’t get enough of their products! Today is the first day of our blog hop- so come back Saturday and Sunday for more projects! 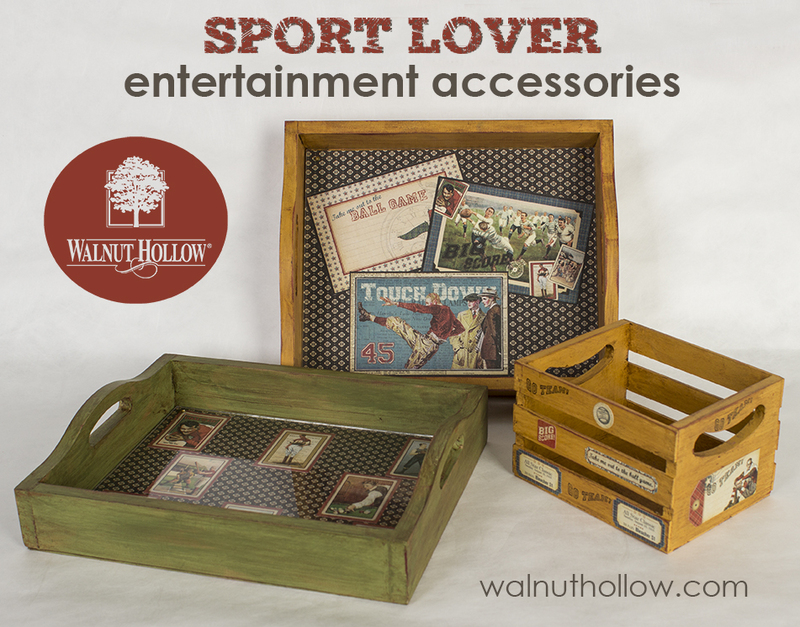 These masculine projects will be fun to use anytime, especially when entertaining for a sports event. The Graphic 45® papers and accessories used come with any type of sports you want for a focus or just mix it up as I did. I’ve gotten “hooked” on DecoArt® Americana® Décor™, Chalky Finish. The more I use them, the more projects I think of where I will need them! You’ll get hooked too – they are so easy to use with fabulous results. You can use them alone, or layer them as I did. 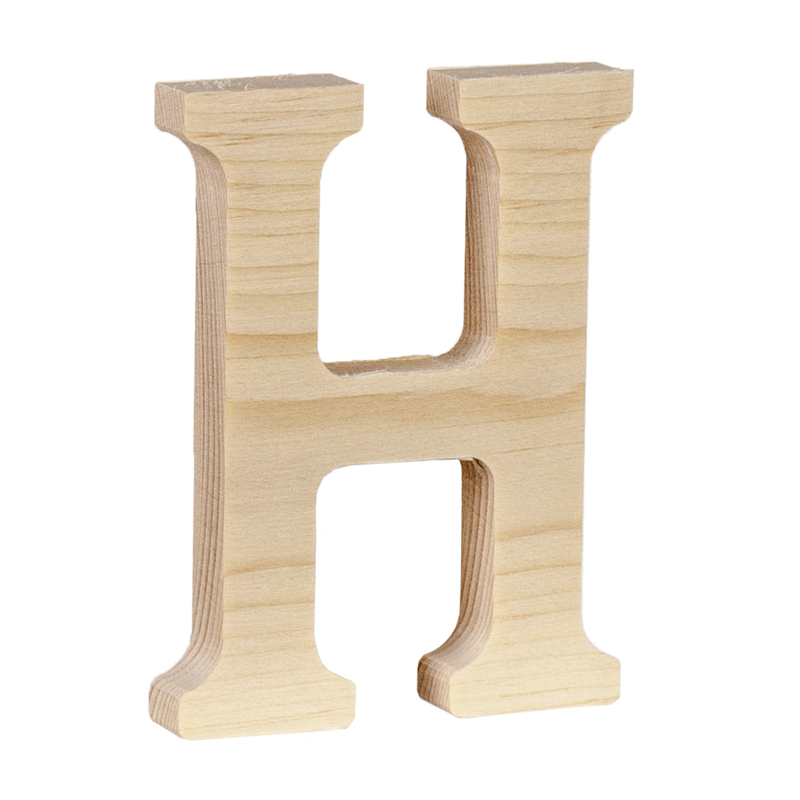 Each piece of wood uses the same basic technique. 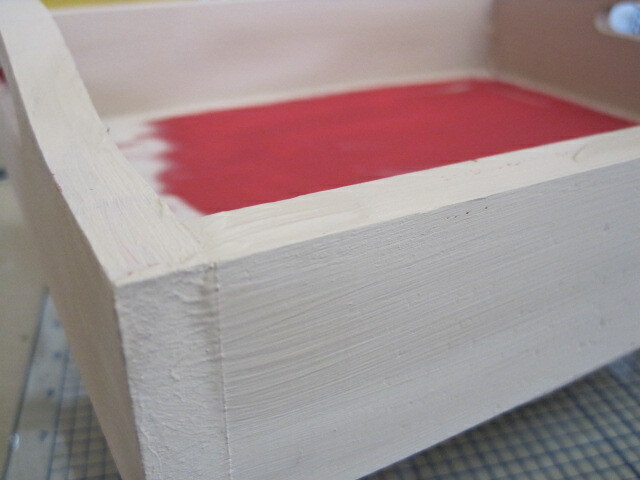 The Mini Crate was basecoated with Rouge using a large flat brush. After it dried, a layer of Heritage was added over the Rouge. I did the same thing with one of the Rectangular Trays. The other Rectangular Tray was layered with Rough, Heirloom, then New Life. 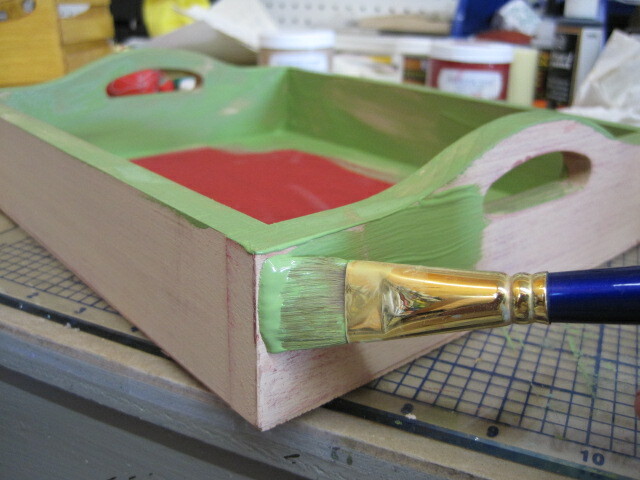 Let all the paint thoroughly dry and sand back the top paint layer to reveal what is under. Sometimes I go all the way down to the raw wood. 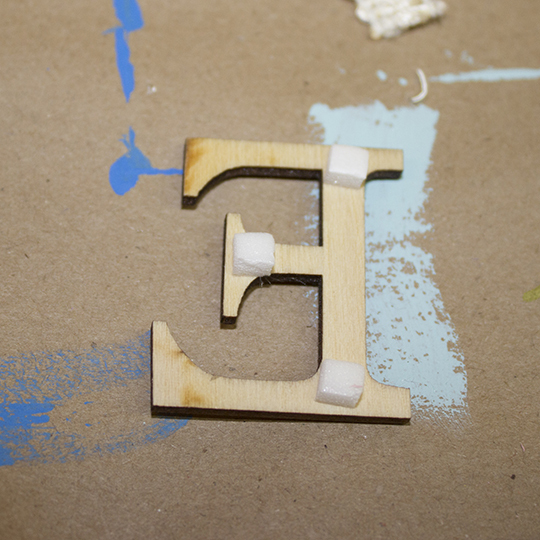 You can use a piece of sand paper, a sanding block or I like to use an electric sander. 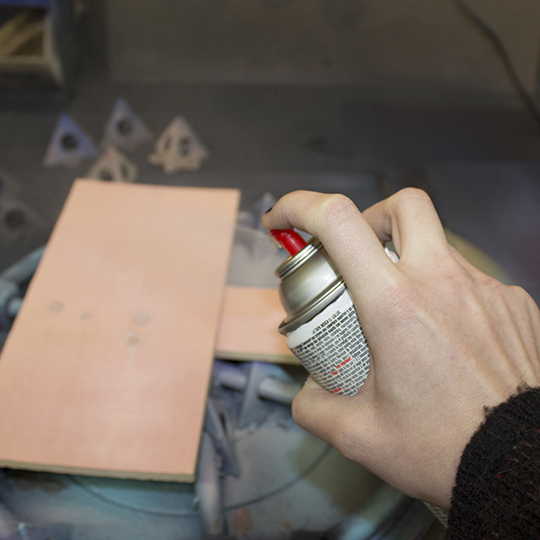 Make sure you sand well on the edges of each piece as well as in other more flat areas. 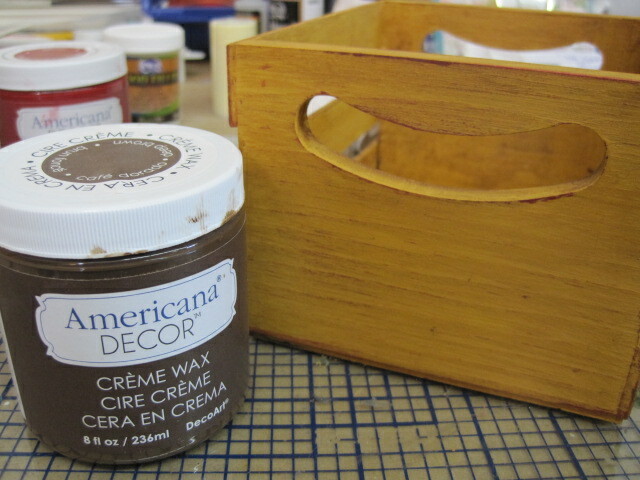 After wiping the wood with a paper towel to remove the remaining dust, use a brush or soft cloth to apply the Crème Wax. I used Deep Brown. Use a small brush to get into the hard-to-reach areas. Wipe off the excess wax. The wax stains areas that are raw wood and antiques the painted areas. When everything is dry, buff the entire piece with a clean soft cloth. I love the feel of the smooth finish the wax gives and you can hear the squeaky waxy finish on the surface if you rub hard with just your fingers. From new to a wonderful vintage look in just a short time! Now for the next fun part. I’m also hooked in Graphic 45® papers and accessories. The look of the Good Ol’ Sport program was perfect for this idea. 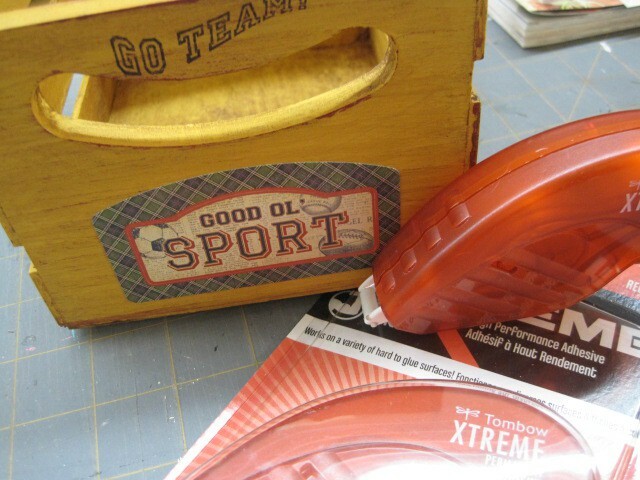 Using a Fiskars® trimmer, I cut the papers, trading cards and postcards to fit inside the Trays. I’m hooked on anything Tombow®! 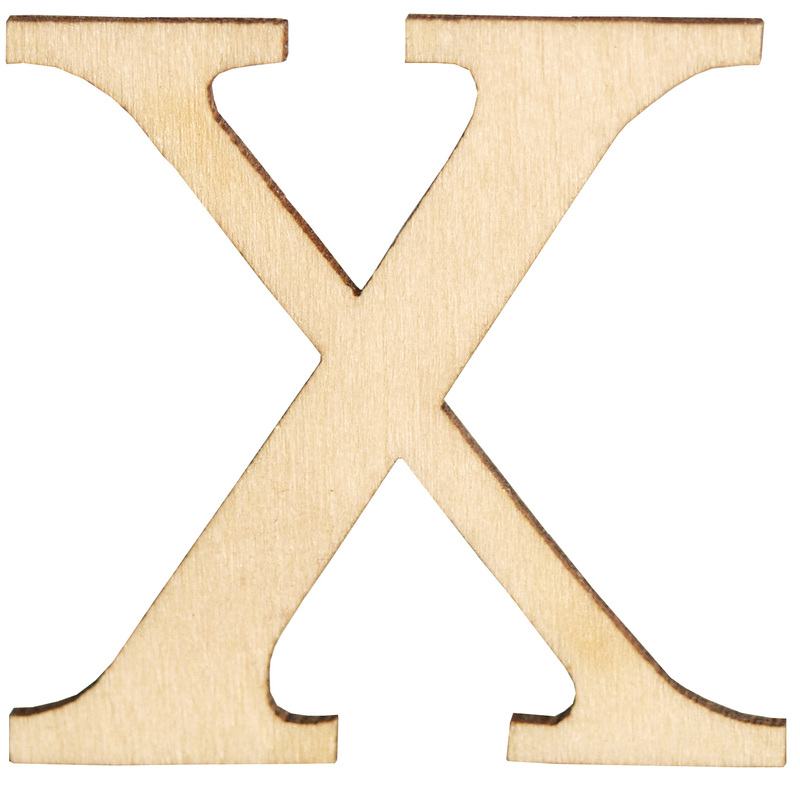 The new Xtreme Adhesive is incredible. I used it to adhere everything to the bottom of each Tray. 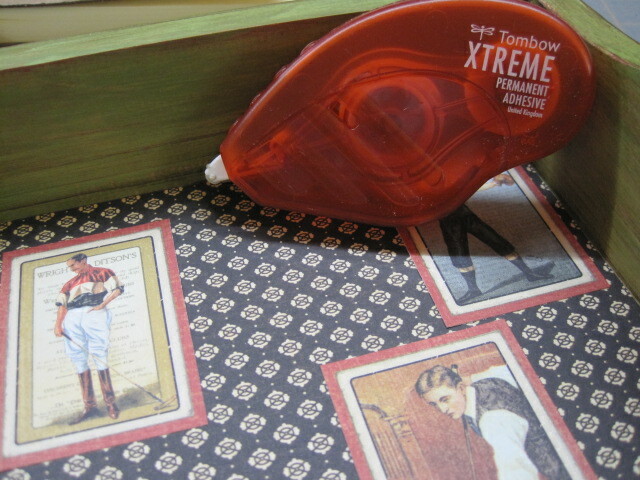 It’s so strong that I can be sure that anything I use Xtreme on will stay in place. 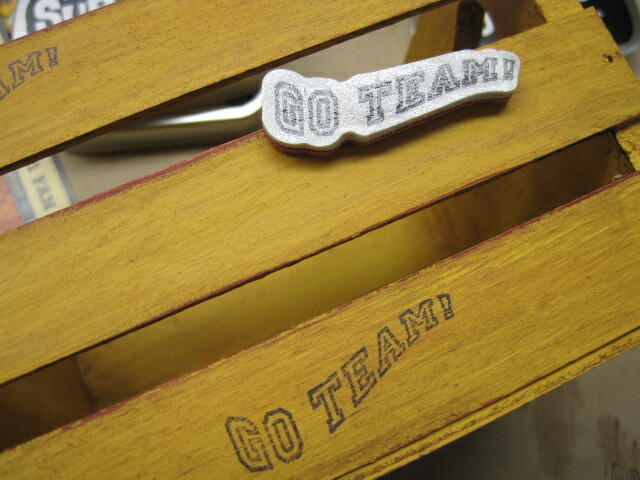 I used a “Go Team” stamp in the set of Good Ol’ Sport Cling Stamps. Using Clearsnap’s Black Surfacez ink pad assures that the image will be permanent on the Crate. 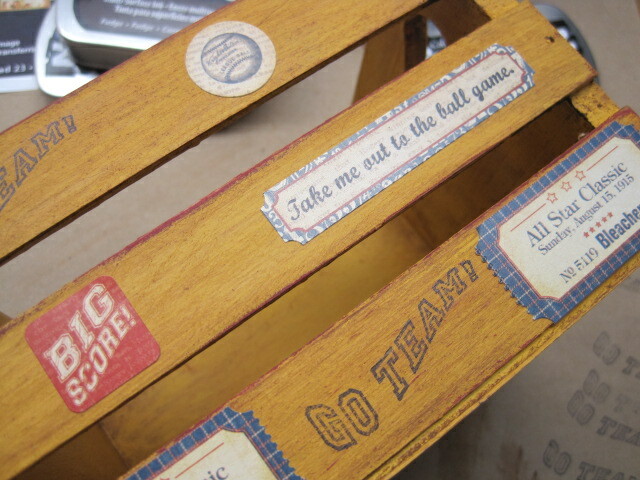 I added a few Good Ol’ Sport Cardstock Stckers to the Crate also. 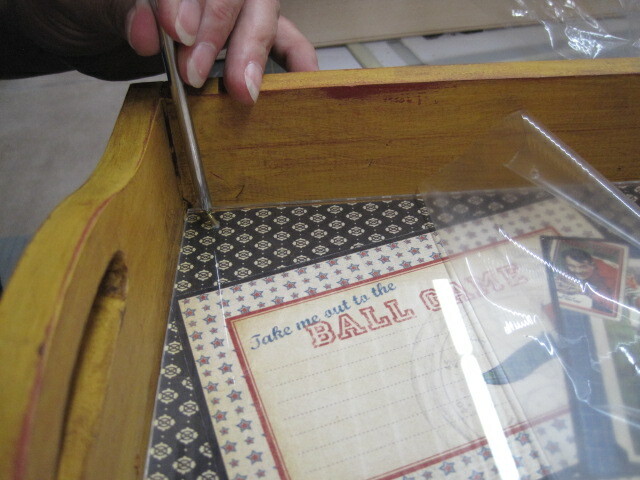 Add a piece of plexiglass as a final touch to protect the papers. You’ll feel comfortable using the Trays for serving anything. You can get the plexiglass from a hardware store and they will cut it to fit. Just add a little starter hole for the screws and place one in each corner – it’s ready to use. Kinda sounds like I’m “hooked”! 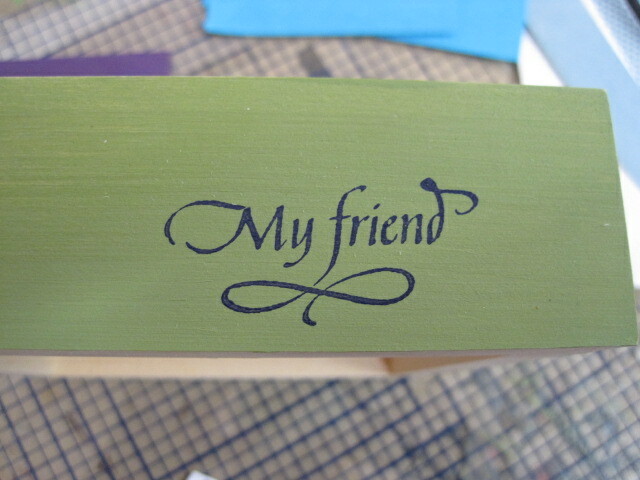 Just on my favorite products………..can’t get enough of Tombow®, DecoArt® or Graphic 45®. Each is a fabulous company with fabulous products. Walnut Hollow enjoys all of them as partners. I don’t think I have a problem, do I? Now that you have seen my sport’s lovers entertainment project, be sure to check out of all of today’s posts! Is it just me, or are wedding décor ideas taking over Pinterest? It could be attributed to the 20,000 wedding boards that I follow… Or it could be a national epidemic? 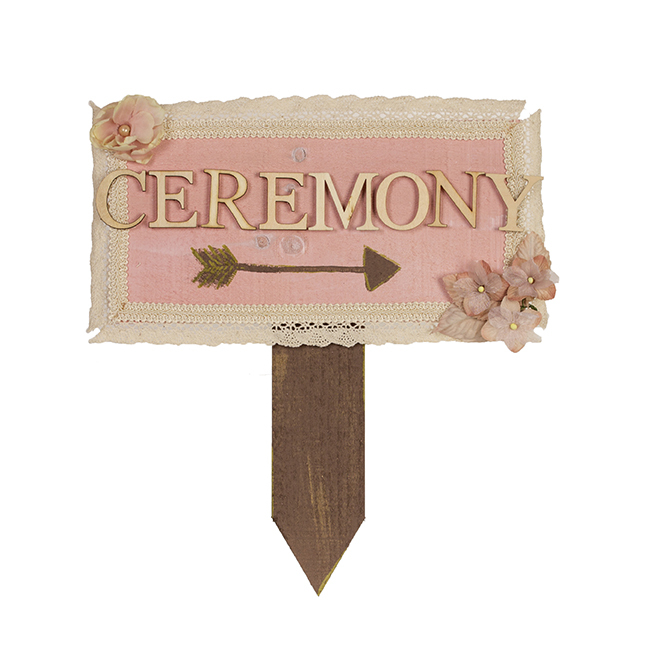 Regardless, a trend that I am particularly drawn to is “Rustic Style” wedding accessories. 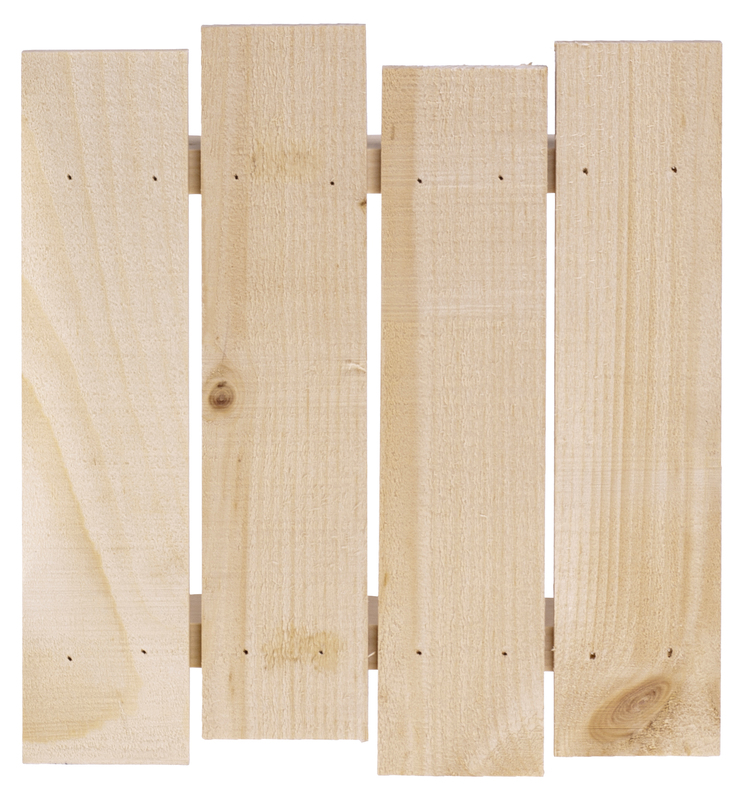 Walnut Hollow carries a lot of items (such as our Rustic Pallet Program and Basswood Country Rounds and Planks) that work very nicely with the Rustic and Shabby Chic wedding trends. 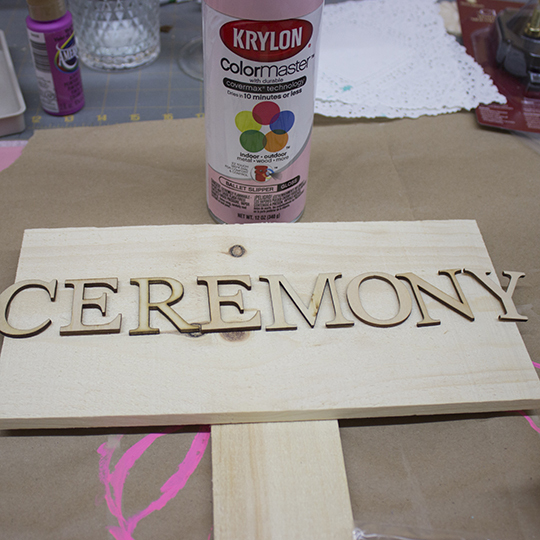 They inspired me to create this Ceremony sign! 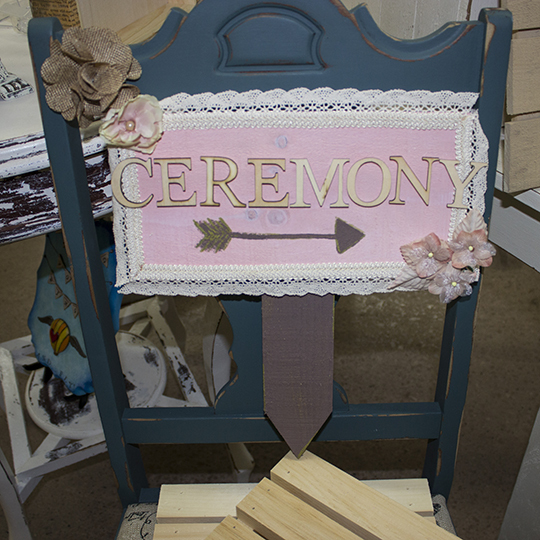 I wanted to showcase the Rustic Market Sign as Stylish Do-it-Yourself Signage for a Rustic Wedding. I started by spraying the Rough-Hewn Pine with Krylon Gloss Ballet Slipper Spray Paint. I sprayed 2 coats. I liked the way that the natural knots in the wood were still visible through the paint. I measured out some Simplicity Trim using the signboard as a guide in length. 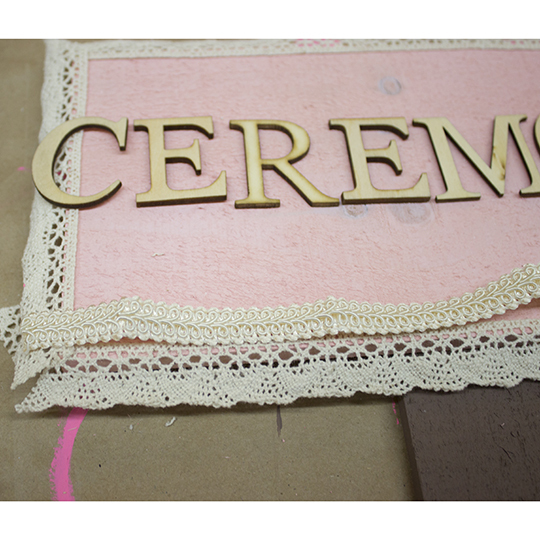 Then I applied Aleene’s Fabric Fusion directly to the signboard and pressed the trim into place. I found some more scraps of trim and added them for a little bit of extra embellishment. I liked the way the heavier trim looked around the border. 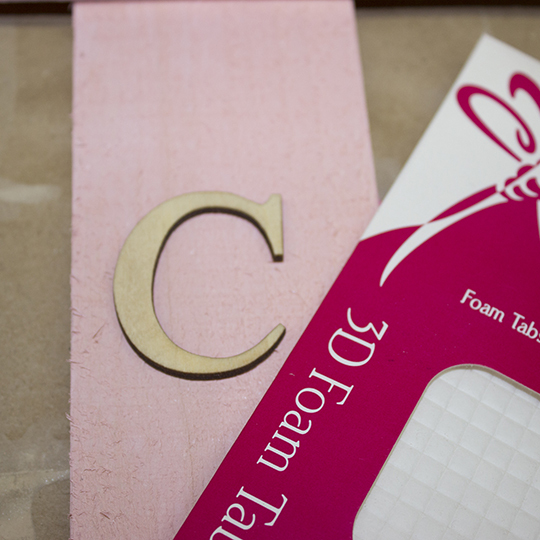 I applied the 1.5″ letters using Tombow 3D Foam Tabs. They were the perfect fit behind the wooden letters and added a little bit of dimension to the sign. 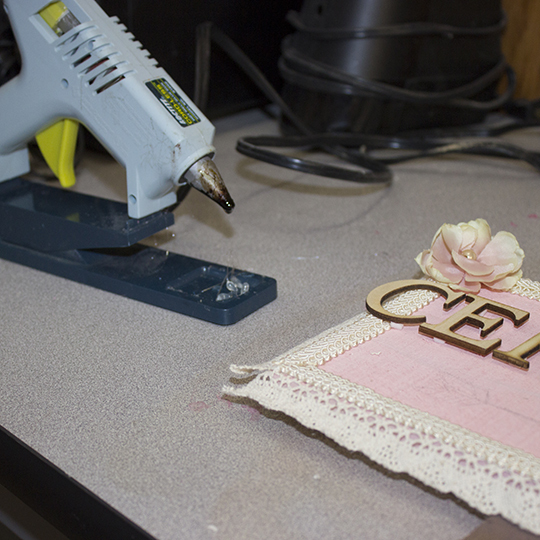 Using a hot glue gun, I applied some gorgeous Prima Flowers to the upper left and lower right corners of the sign. I drew my arrow using a pencil then traced over it with a small paint brush and the same paint I used for the stake. 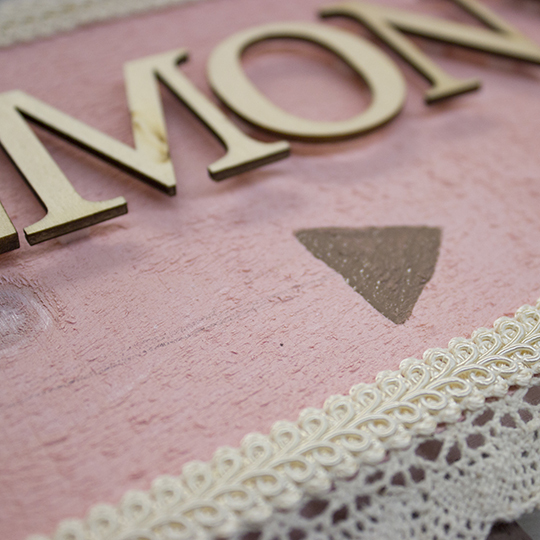 I used a Gold Permapaque Opaque Pigment Marker to add some subtle sparkle to the arrow and to the stake. And Voila! 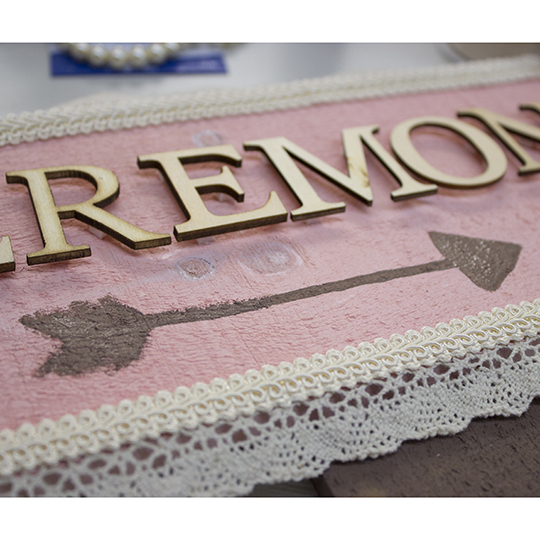 A Rustic Wedding sign! While designing projects for our Rustic Pallet Program, I found the fabulous Graphic 45 French Country paper. I’m such a big fan of Graphic 45 and love the unmatched beauty in the wonderfully designed papers – regardless of the program theme. 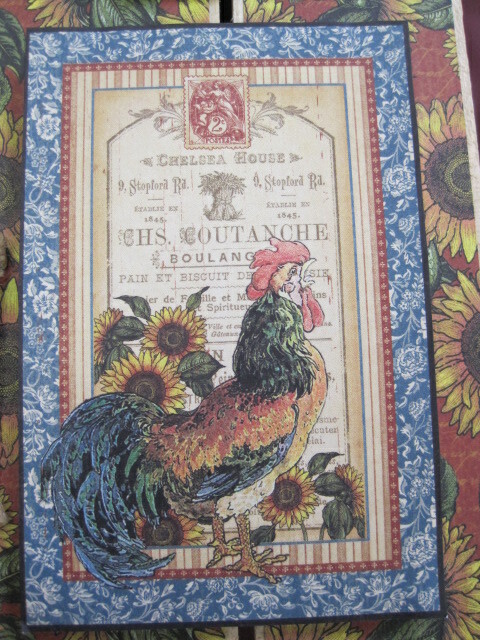 Using the 12 x 12 French Country paper pad, I chose the paper filled with Sunflowers for the background. 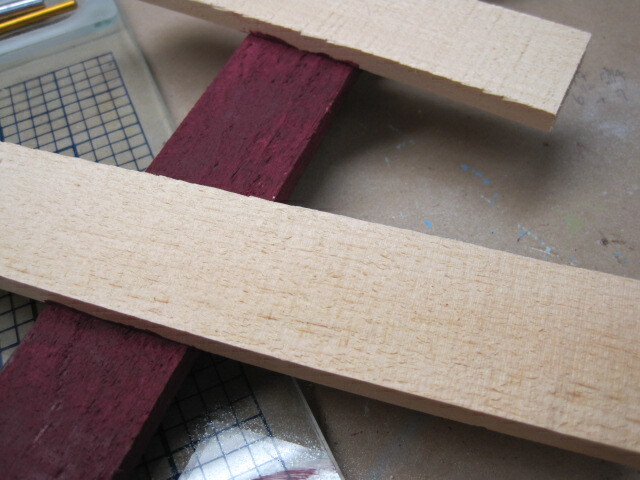 I cut 4 strips 2 3/8” x 11 ½ to attach to each of the wood strips. This particular Rustic Pallet piece is really rustic/rough so I used Tombow’s MONO Multi Liquid Glue to adhere the paper to the wood. 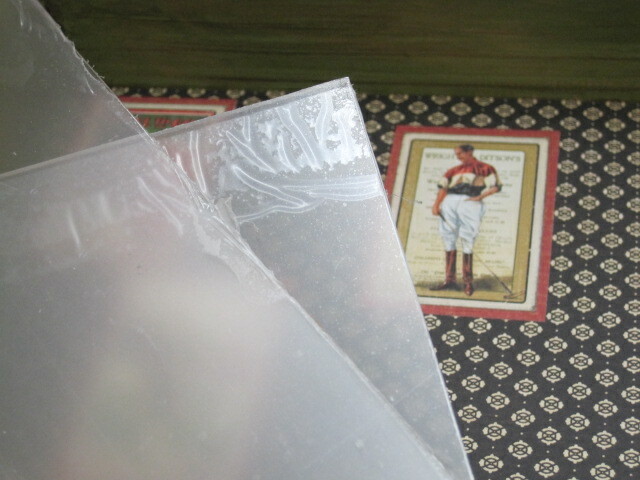 After the paper was in place, I used a brayer to make sure it was really secure. 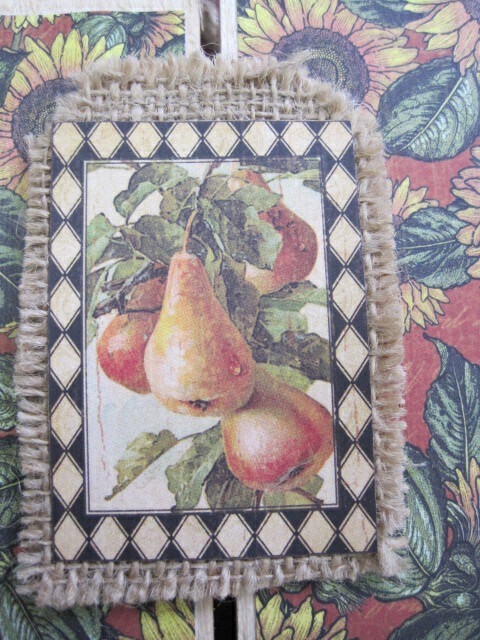 The Bon Appetit paper in the French Country Collection was cut to make small fruit tags attached to Canvas Corp burlap tags. 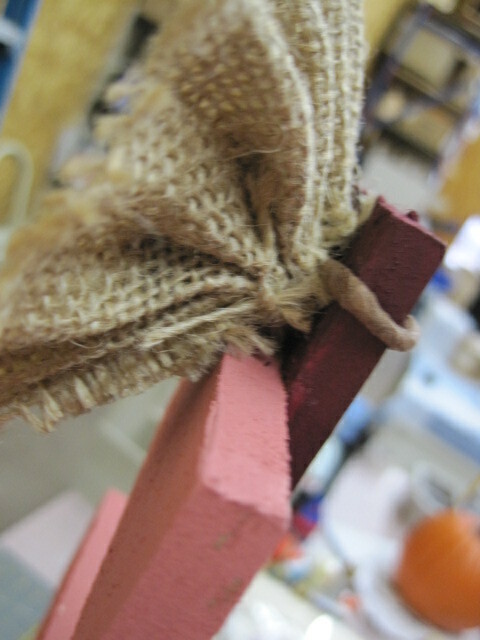 The burlap adds more texture to the project, which I was looking for. 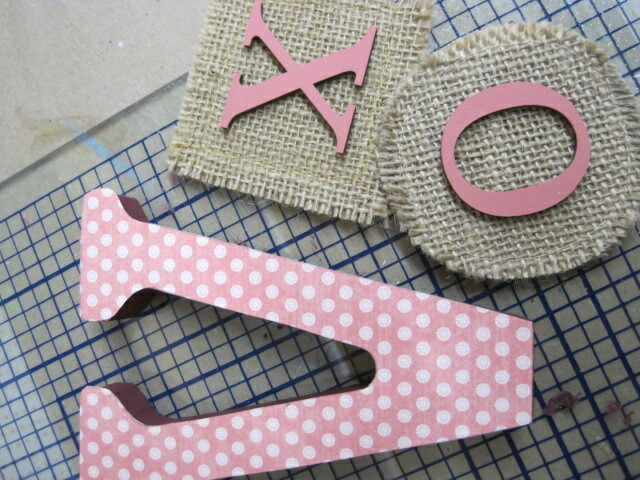 I cut the paper 2” x 3” to fit the ready-made 2 3/8” x 3 1/2” burlap tag. I adhered each of the fruit tags to the piece using Tombow’s Power Adhesive Tabs which worked great. I found a large rooster on the A La Carte paper in the Collection. I cut the rooster paper 3 7/8” x 5 7/8” to fit a piece of foam board cut 4” x 6”. I mounted the rooster paper on the foam board because I wanted different layers as well as textures. Again, I used the Power Tabs to adhere the foam board to the piece. If you have a Creative Versa-Tool or a HotKnife Tool from Walnut Hollow, it sure makes cutting the foam core board a lot easier. Just let the heat from the Tool slice through the foam board like butter! 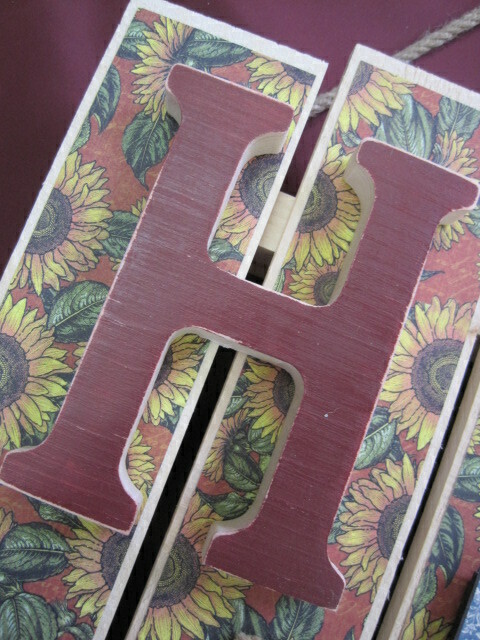 I painted the “H” on the top surface only with one coat of DecoArt® Americana® Cranberry Wine. Once it was dry, I sanded it back around the edges for a worn look. 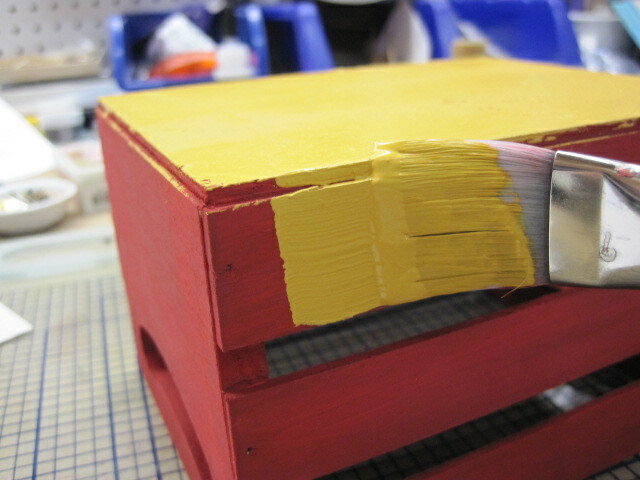 Then I used the Power Tabs to adhere it to the top left of the Rustic Pallet piece. 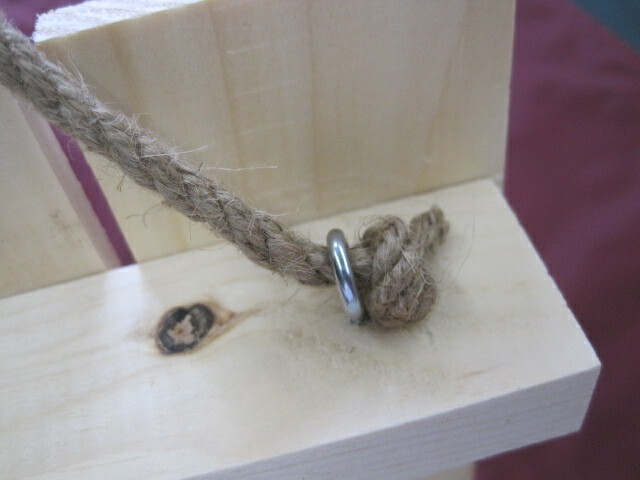 The last step is to attach thick rope to the back of the piece for hanging. I used 2 large screw eyes on each side of the top wood brace. After putting the rope through one side, tie a large knot, then do the same on the other side, cutting the rope so the piece hangs as you want it to. This mixed media project would make a nice addition to a group of items to display on a wall, or to hang alone.